Check back here from time to time to get updates on what we like, exhibits to see, and art related ideas. If you’re interested in more information about what you see here, please email us. 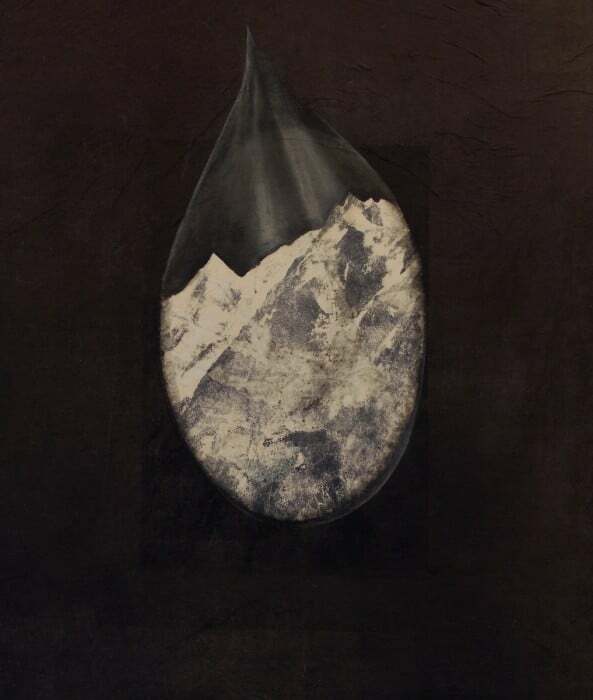 Stas Orlovski, “Teardrop with Mountain”, 2017. Image courtesy of Traywick Contemporary. 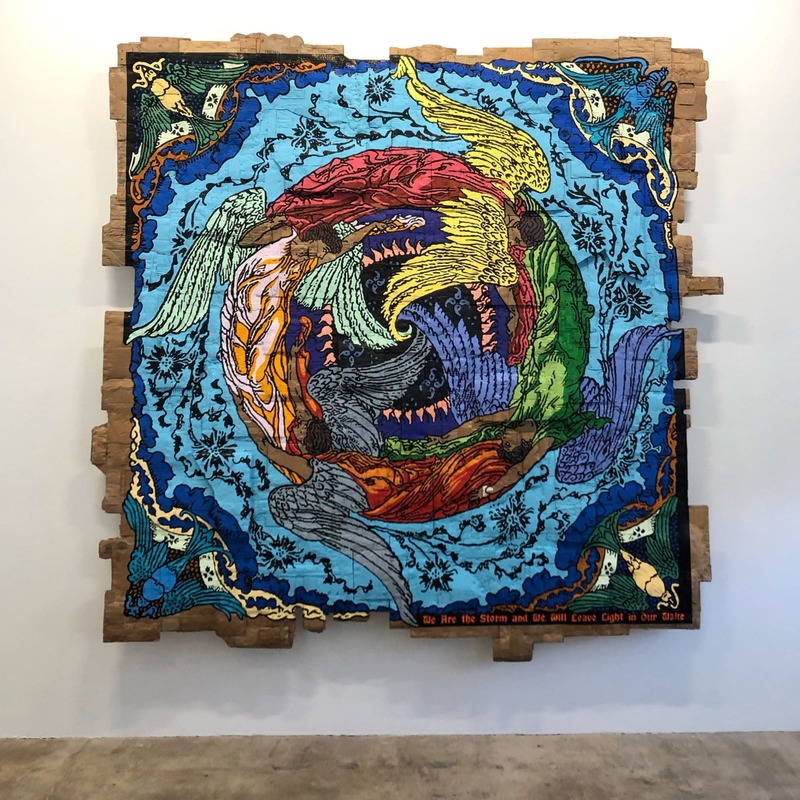 Ongoing to May 25– Stas Orlovski: обjект at Traywick Contemporary: Los Angeles-based artist, Stas Orlovski incorporates a variety of imagery from diverse sources such as Japanese woodblock prints, Victorian era journals, and Russian modernism into his collage-based practice. His works also involve a variety of media including printmaking, drawing, transfer, and painting. The body of work in the exhibition is autobiographical, referencing memories and dreams from Orlovski’s childhood, and also art historical movements such as Russian Suprematism, European Surrealism, and Soviet experimental animation. Throughout the exhibition, similar themes of migration and loss are expressed with a sense of absurdity and humor. Orlovski’s work acknowledges the powerful experience of a collective history, and the ephemeral nature of personal memory. Traywick Contemporary is located at 895 Colusa Avenue in Berkeley. Alec Soth, “Nick, Los Angeles”, 2019. Image courtesy of the artist and Fraenkel Gallery. Ongoing to May 11– Alec Soth: I Know How Furiously Your Heart Is Beating at Fraenkel Gallery: Taking its name from a line in Wallace Stevens’ poem “The Gray Room,” the works in the show investigate the possibilities and limitations of what photographs can convey about the inner lives of their subjects. Often the result of extended engagements with the people Soth photographs, the large-scale portraits and interiors were made in the U.S. and Europe. The subjects are artists, writers and choreographers, among others. Intimate and quiet, the images reveal something otherwise unknowable about both the sitter and the photographer. Fraenkel Gallery is located at 49 Geary Street, 4th Floor. Todd Hido, “Untitled #176”, 1994. Image courtesy of Casemore Kirkeby. April 2, 7 to 8pm– Todd Hido Lecture at Minnesota Street Project: As part of the Larry Sultan Visiting Artist Program, Bay Area photographer Todd Hido will give an artist talk referencing his three decades of work. 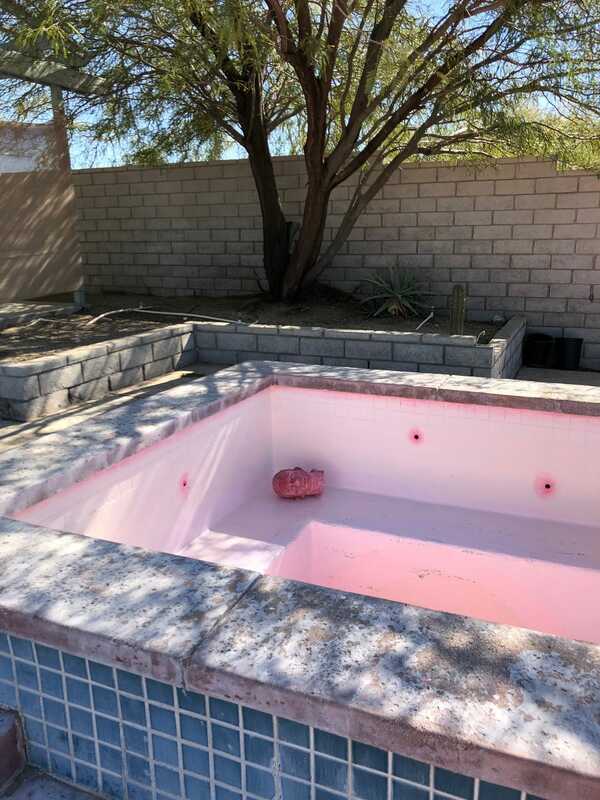 Hido photographs around North America creating haunting narratives through images of suburban scenes, desolate landscapes, and stylized portraits. His work has a cinematic aesthetic that communicates to viewers in a distinct visual language full of psychological tension and emotion. Minnesota Street Project is located at 1275 Minnesota Street. Tom Burckhardt, “Psychodiagnostik”. 2018. Image courtesy of Gregory Lind Gallery. 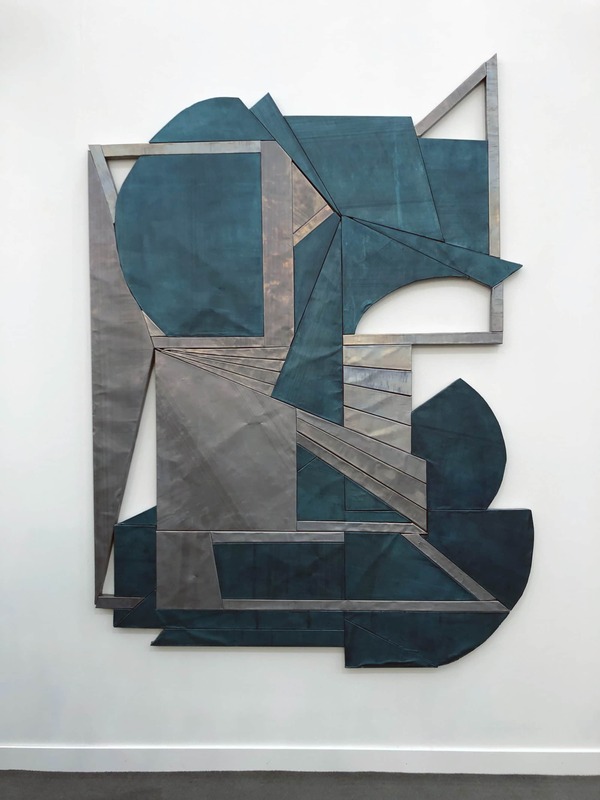 April 4 to May 18– Tom Burckhardt: Psychodiagnostik at Gregory Lind Gallery: Burckhardt’s recent works explore the line between figuration and abstraction, with an emphasis on how our perceptual biases impact us. The concept of pareidolia, in which figuration or faces are read in abstract visual phenomena, is key to his works. Imperfection is built into Burckhardt’s process, as he always starts with a single panel, painted intuitively, which he completes before moving on to the next panel, where he works to create the same image in reverse. One side reveals an improvisational process, while the other is executed in an analytical fashion. By working on two panels at different times, and then adjoining the original and its mirror image, Burckhardt emphasizes the paradox of a symmetrical image that is literally split down the middle, revealing both its wholeness and its inherent sense of division. 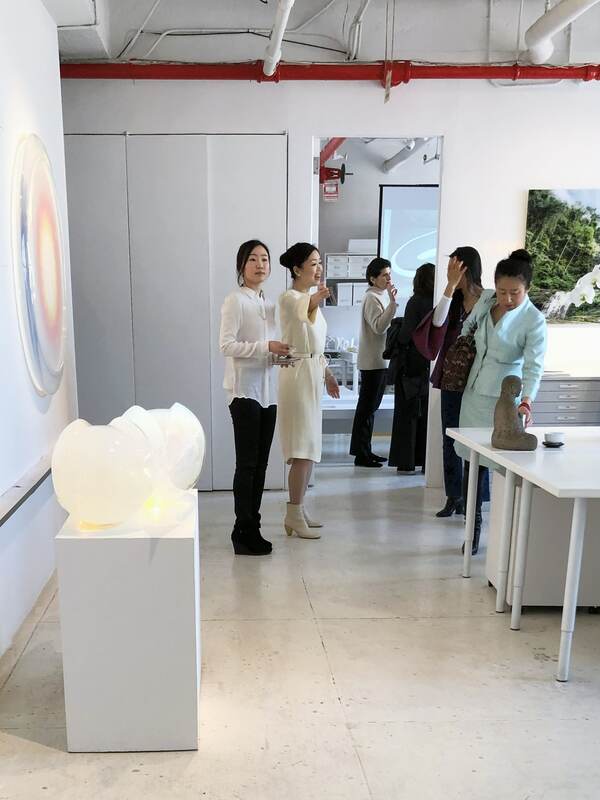 Gregory Lind Gallery is located at 49 Geary Street, 5th Floor. (left) Josephine Taylor, “Darrow”, 2018. (middle) Libby Black, “Some Women”, 2017. 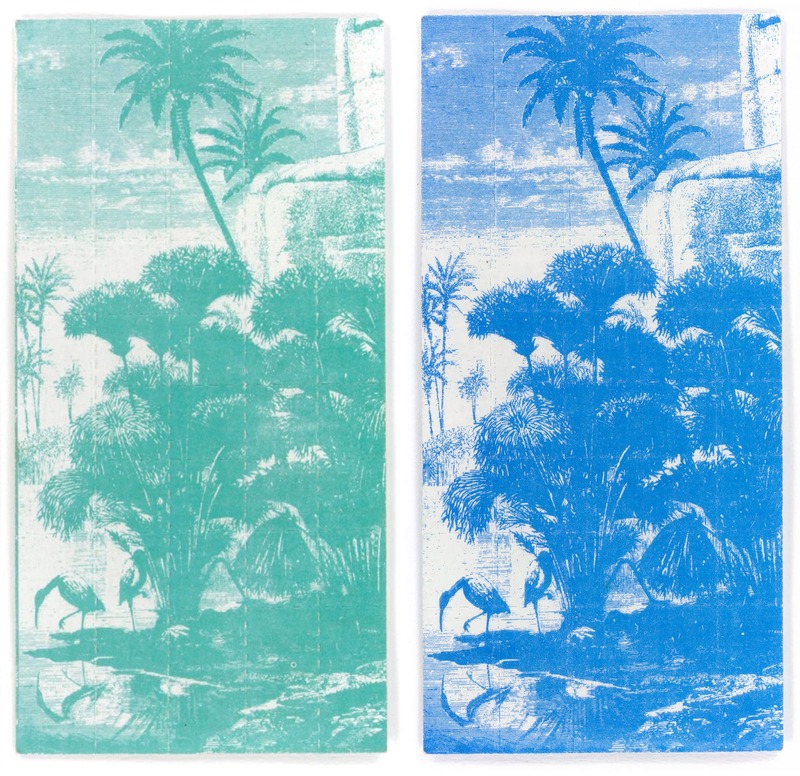 (right) Taravat Talepasand, “Customs and the Manners of the Women of Persia, and their Domestic Superstitions I (detail)”, 2019. Images courtesy of Gallery 16. 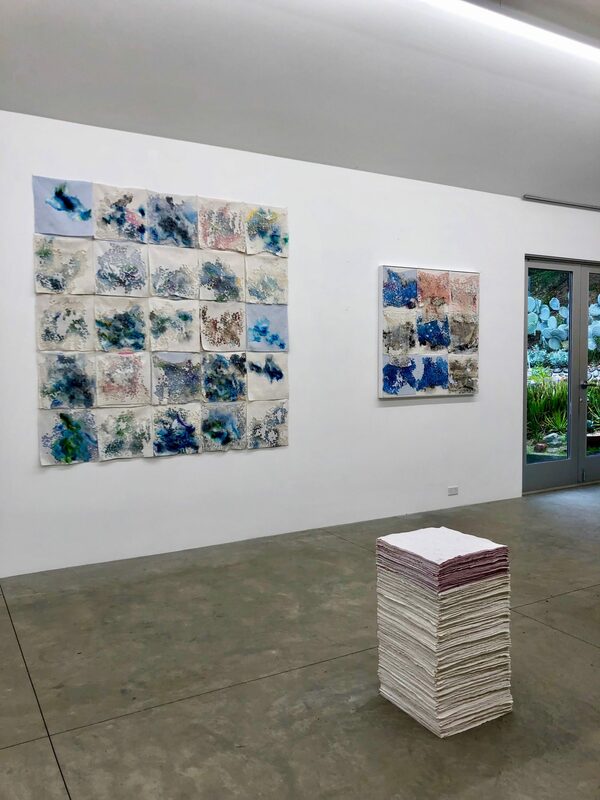 April 5 to May 31– Epoch: Libby Black, Taravat Talepasand, Josephine Taylor at Gallery 16: The definition of epoch is a period of time in history or a person’s life typically marked by notable events or particular characteristics. The long-standing friendship between Libby Black, Taravat Talepasand, and Josephine Taylor, has woven it’s way through many spheres of life: love, home, motherhood, work, culture, community, history, politics. What began two years ago as a correspondence via email between the artists evolved into a greater dialogue about what it means to be an artist, a feminist, a teacher and a mother. Inspired by a mutual love and respect for each other’s work, practice and careers, the exhibition presents the work of these artists in dialogue together for the first time. Through various methods of appropriation, re-authoring and the shifting of perspectives, Black, Talepasand and Taylor explore ideas of domesticity and the presence of women in their work. Gallery 16 is located at 501 3rd Street. 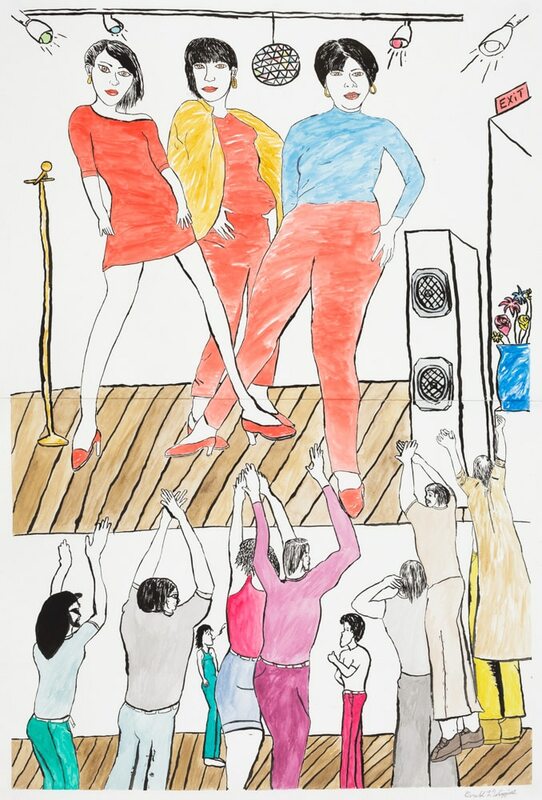 Gerald Wiggins, “Untitled (The Supremes)”, 2018. Image courtesy of Creativity Explored. 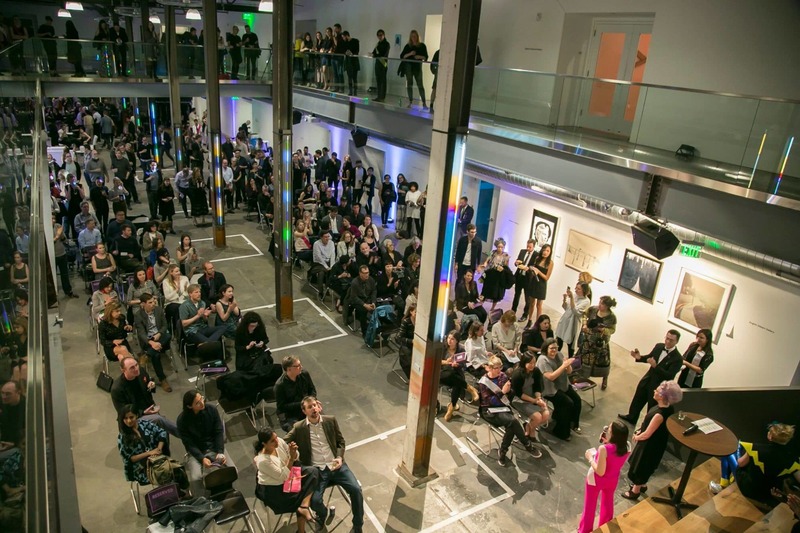 April 5, 5 to 9:30pm– Art Changes Lives Auction and Gala Hosted by Creativity Explored at City View at METREON: Creativity Explored gives artists with developmental disabilities the means to create and share their work with the community. Creativity Explored’s annual auction and gala celebrates the power of art to change lives with dinner, drinks, and the exclusive opportunity to bid on some of the best works of art created by the talented artists working in their studios. City View at METREON is located at 135 Fourth Street, 4th Floor. Sally Scopa, “All the Oceans”, 2018. Image courtesy of Embark Gallery. 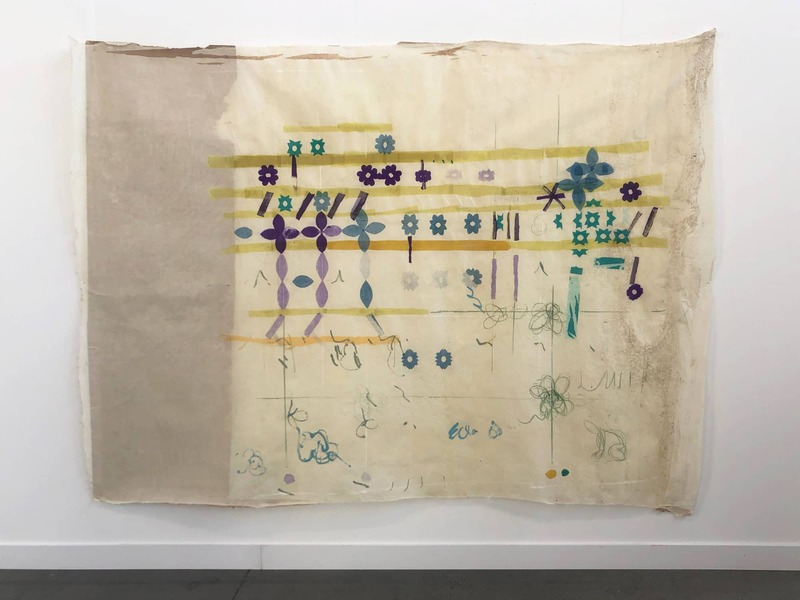 April 13 to May 18– Out of Line at Embark Gallery: The exhibition features eight Bay Area artists who create drawings made with anything but pen or pencil: light, fabric, seeds, architectural drafting software and even heavy metal particles from air pollution. Like ghostly memories of the actions of the artist, the artworks in this show capture the immediacy and intimacy we recognize in traditional drawing. 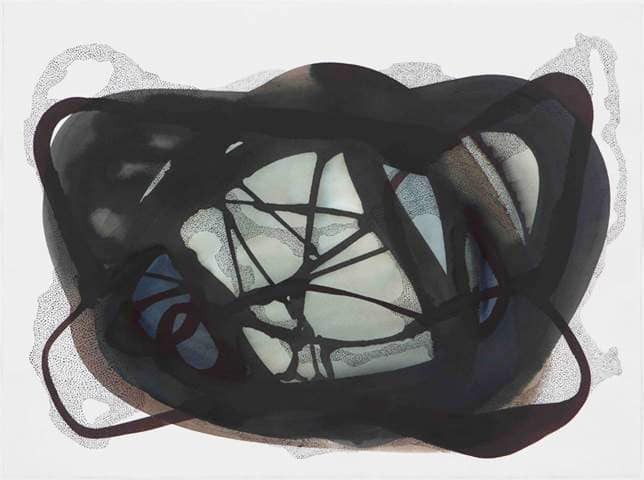 Through their use of innovative materials and techniques, they add layers of complexity to the act of mark making, while still doing the essential work of drawing. The artists detect and highlight the shape of the world in new and interesting ways. Embark Gallery is located at 2 Marina Blvd, Building B (3rd Floor), Suite 330. Natani Notah (left) “Red (Blood), White (Gold), and Blue (Ocean), Bolo (2/7)”, 2017​. (right) “I Dreamt an Asteroid Came, Bolo (3/7)”, 2017. Image courtesy of the artist. 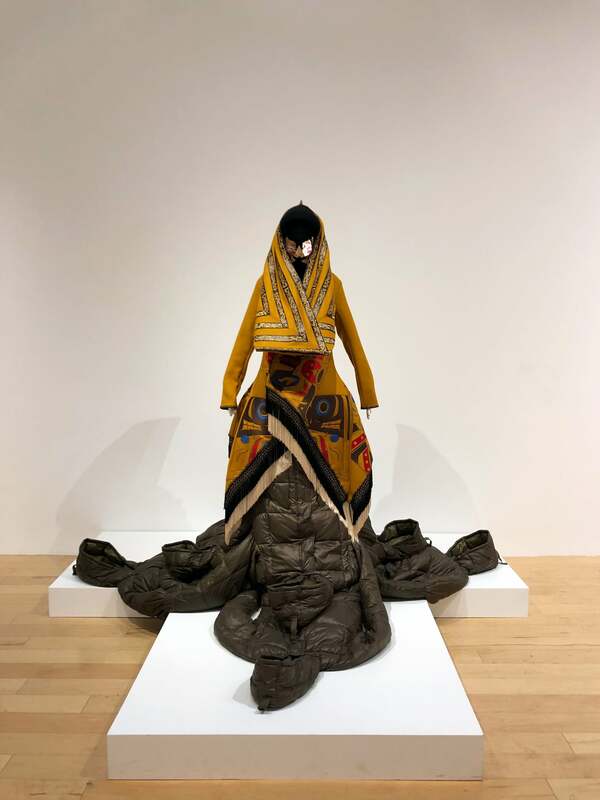 April 4 to 28– Divinely Diné at Adobe Books Backroom Gallery: Through mixed media sculptures and detailed works on paper, the exhibition ​explores the connections between culture, politics, and survival. For Natani Notah, bringing disparate entities together to coexist serves as a generative act of healing from intergenerational trauma. Part prayer and part declaration, ​Divinely Diné​ disrupts our conceptions of what we think it means to be a Native American woman living in the present-day U.S. Adobe Books Backroom Gallery is located at 3130 24th Street. View of a past open house event. Image courtesy of Headlands Center for the Arts. April 14, 12 to 5pm– Spring Open House at Headlands Center for the Arts: The Open House is free and open to the public. It provides a once-a-season opportunity to roam the various buildings of the Headlands Center for the Arts campus, meet the current artists in residence, view works in progress, and attend screenings, performances, and readings. You will also have the opportunity to engage in a hands on, creative reuse art activity and enjoy a house-made lunch. Headlands Center for the Arts is located at 944 Simmonds Road in Sausalito. Installation view of Davina Semo’s “Precarious Hardware” exhibition. Image courtesy of Jessica Silverman Gallery. 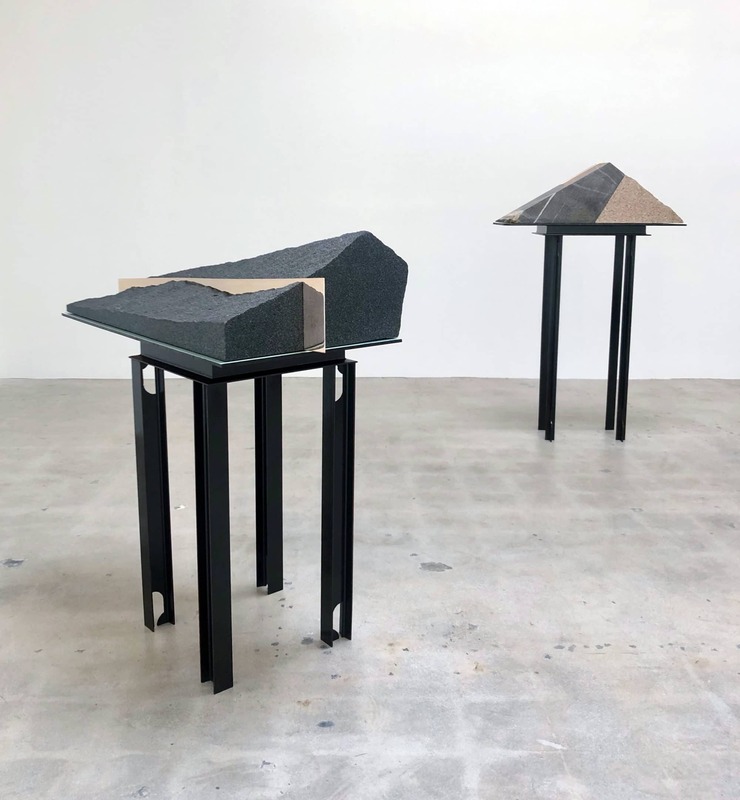 Ongoing to May 4– Precarious Hardware: Davina Semo at Jessica Silverman Gallery: San Francisco based artist, Davina Semo creates rough and glossy sculptures. Combining works from four diverse series, the work explores the tension between nature, society and the self, as well as the philosophical troika of liberty, beauty and power. 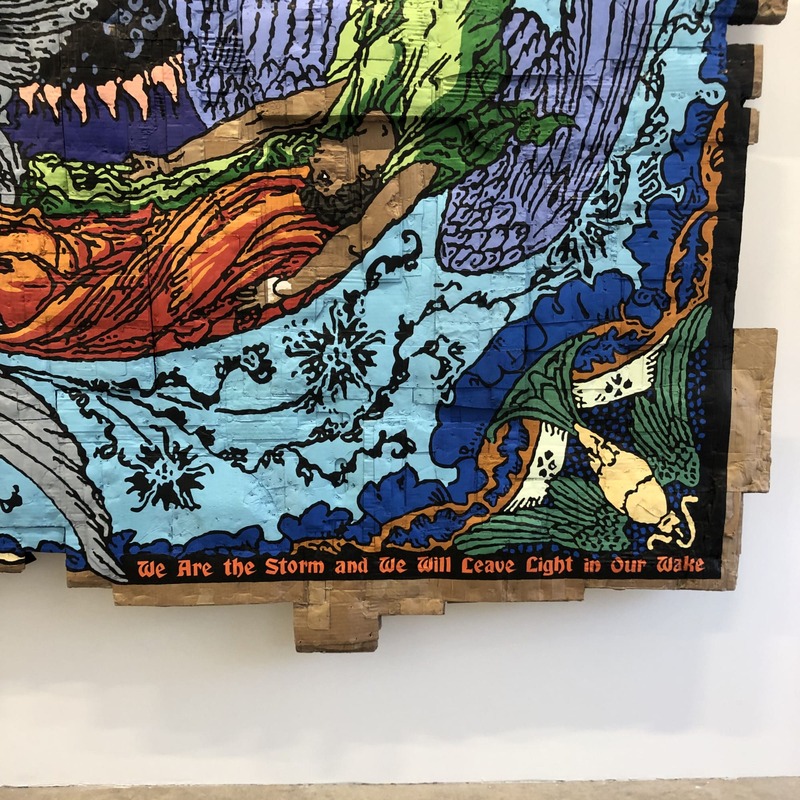 The exhibition is taut with contradiction, riffing on the relationships between strength and vulnerability as well as natural growth and destruction. 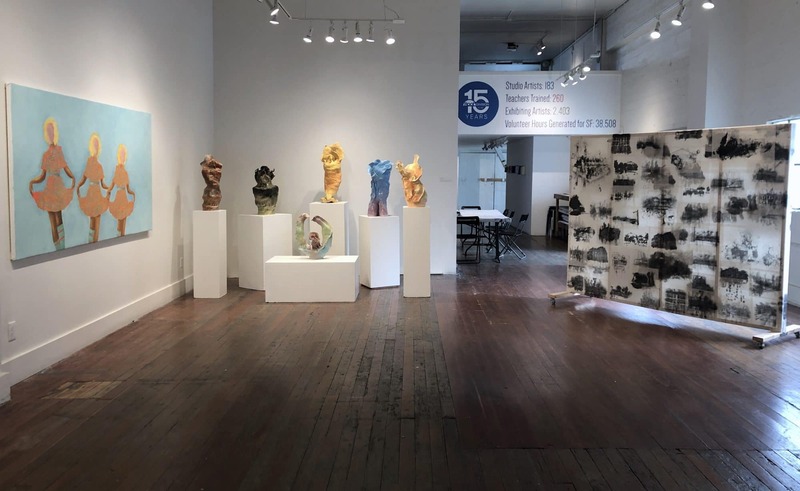 Jessica Silverman Gallery is located at 488 Ellis Street. View from last years event. 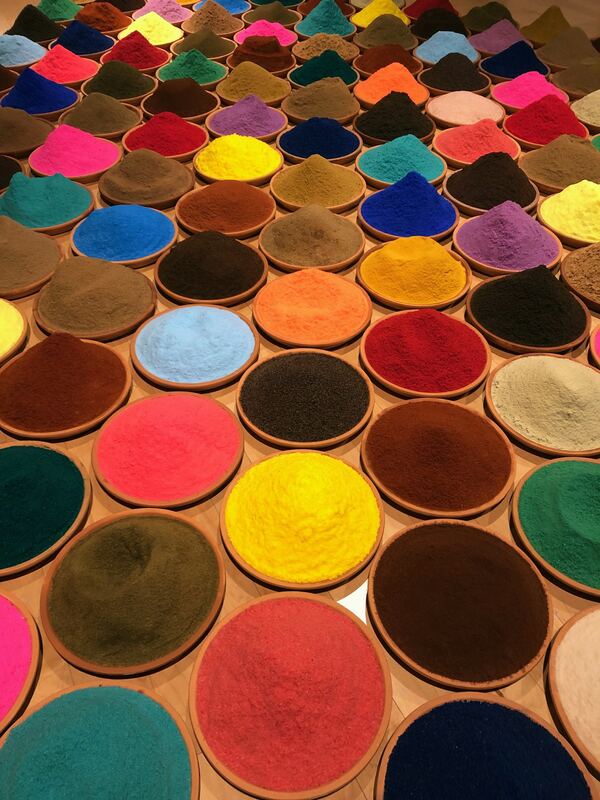 Image courtesy of Art Market San Francisco. 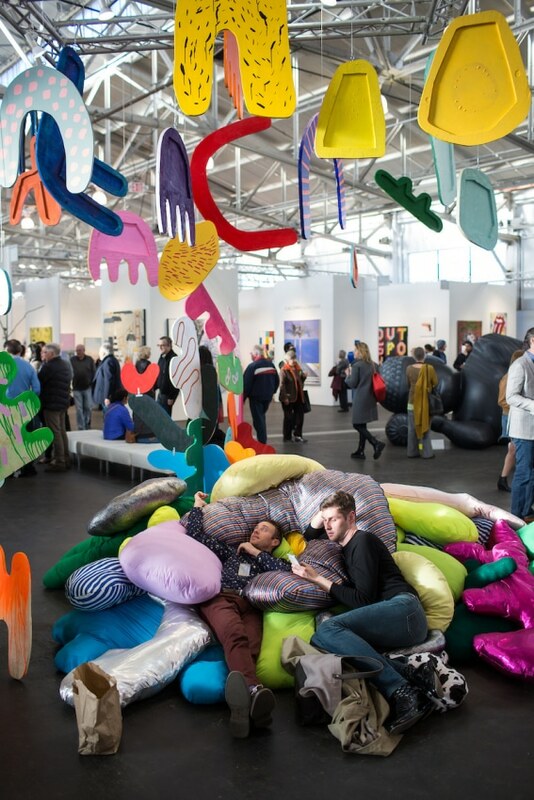 April 25 to 28– Art Market San Francisco at Fort Mason Festival Pavilion: Art Market San Francisco is an art fair that is now going into its ninth edition. The fair will feature seventy-five modern and contemporary art galleries from around the world bringing some of the world’s most intriguing artists and galleries to San Francisco. 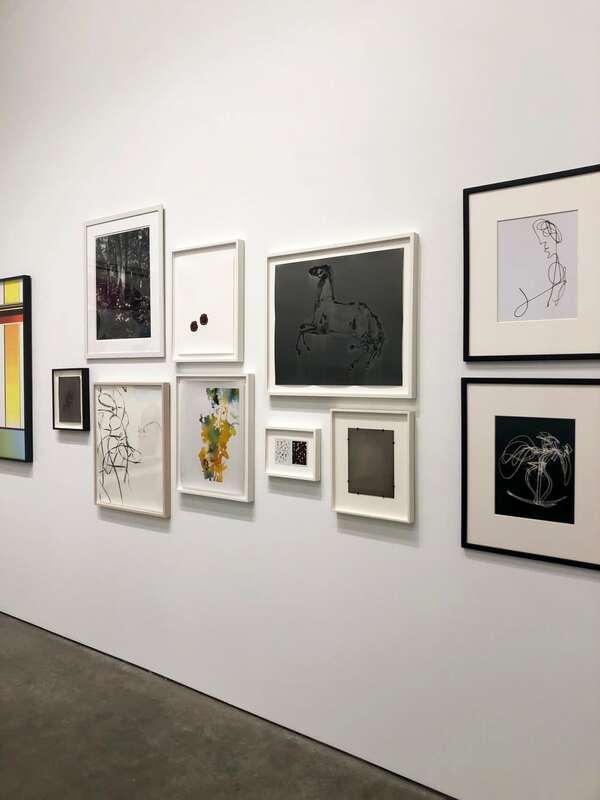 In showcasing historically important work alongside relevant contemporary pieces and projects, Art Market San Francisco creates an ideal context for the discovery, exploration, and acquisition of art. Fort Mason Festival Pavilion is located at 2 Marina Blvd. 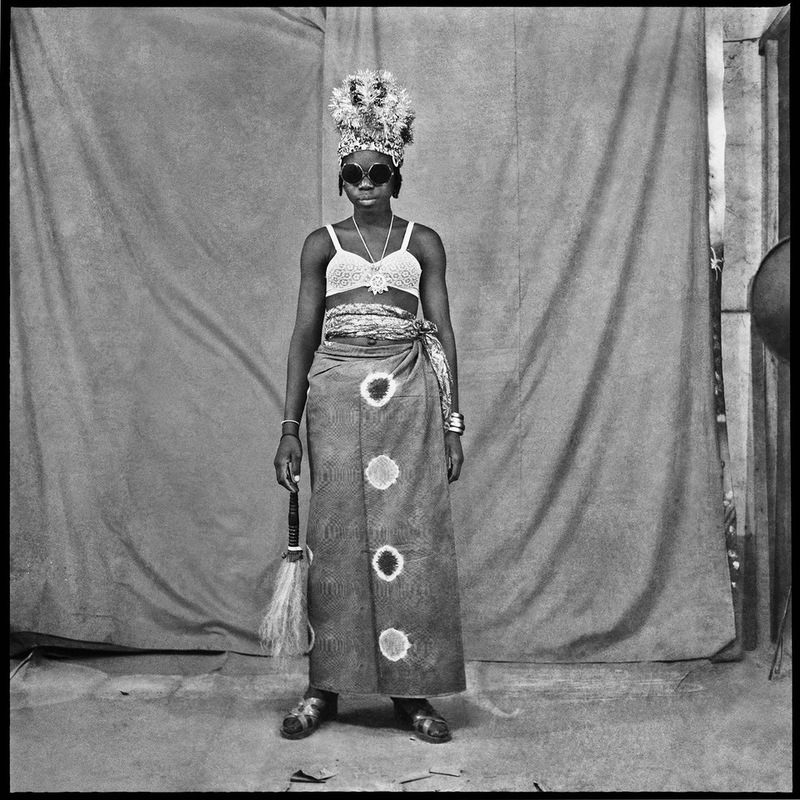 Sanlé Sory, “Chasse-Spleen”, 1972, black and white photograph. At Yossi Milo Gallery. Tucked away in a side gallery was a small group of work by Sanlé Sory, who is from Burkina Faso, West Africa. Originally a commercial photographer, these spectacular portraits document his clients and friends from the 1960’s to 1980’s. These portraits were sought to be captured in ways that reflect their dreams and desires. 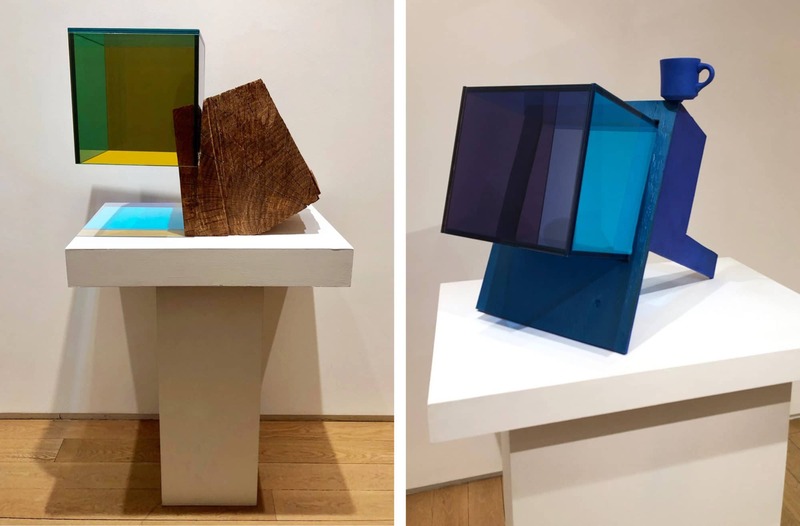 Sarah Braman, (left) “Growth”, 2019, oak and glass. (right) “Blue coffee”, 2019, painted aluminum and glass. At Mitchell-Innes & Nash. Braman’s sculptures serve as monuments to everyday life. She is interested in the interplay between sensory experience and emotional resonance. In creating her precariously balanced sculptures, Braman combines found everyday objects with translucent volumes of color and light. The artist’s distinctive color palette of rich pinks, blues, and purples permeates the space. Zipora Fried, “All I thought and Forgot (Delft blue)”, 2016, colored pencil on paper. At Sikkema Jenkins & Co. Image courtesy of the gallery. The installation of this large-scale drawing prompts the viewer to confront the physical nature of a work on paper outside the familiar two-dimensional frame. Zipora Fried, “Thadeo”, 2017, colored pencil on archival museum board. At Sikkema Jenkins & Co. Image courtesy of the gallery. Fried’s color pencil drawings consider how individual gestures can be deconstructed and rearranged, emphasizing the beauty of mark-making within each stroke of color. The visual frame is constructed via a rhythmic weaving of color and line, drawing attention to subtle variations in light, tone, and shadow. Sam Moyer fused glass works. (left) “Small Bond No. LIII”, 2019. (middle) “Small Bond No. XLVI”, 2018. (right) “Small Bond No. XXXIV”, 2019. At Sean Kelly Gallery. Moyer is known for using discarded stone and marble within her carefully crafted paintings. This new work takes the same approach but with new material. 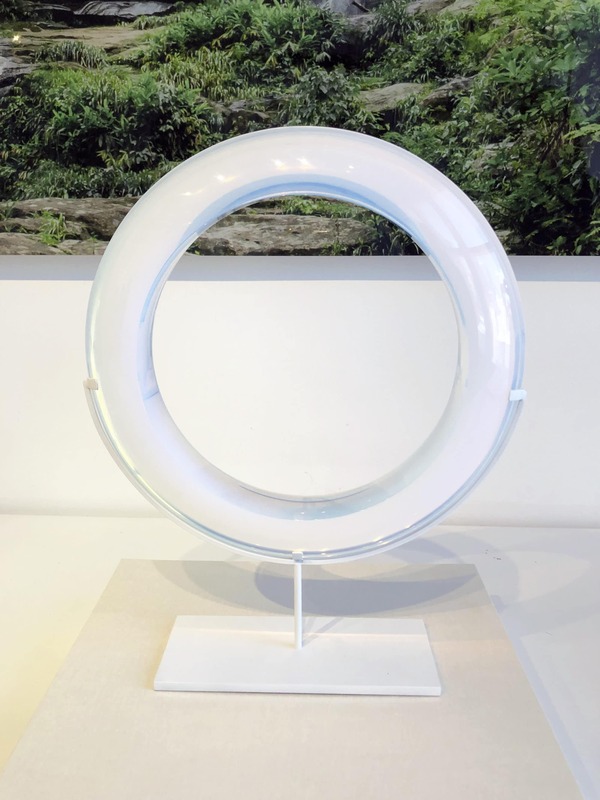 These new glass works are an investigation into the nature of materiality of fused glass. 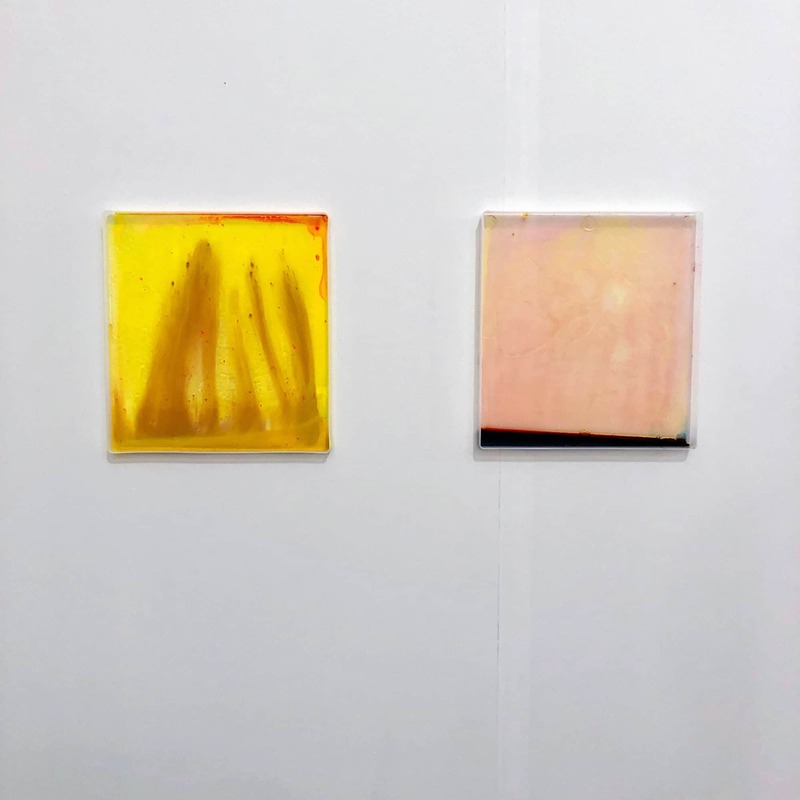 Drawn to glass for its simultaneously fluid and solid states, Moyer exerts a high degree of control in making her compositions but embraces the uncertainty that occurs once they are fired in the kiln. Lesley Vance, “Untitled”, 2019, oil on linen. At Bortolami Gallery. 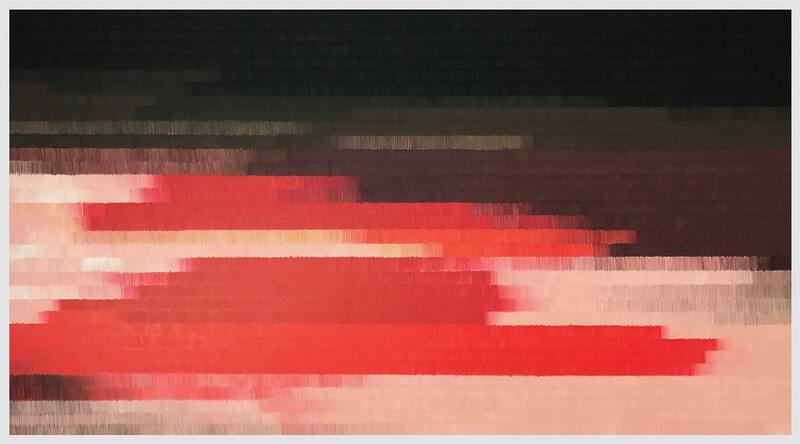 Vance’s masterful paintings evolve with optical depth. She lets the underpainting serve as an element in the work. The paintings are shaped by a slow, improvisational process in which colors and marks are transformed into the fully formed visual motifs. As paintings progress within their own subconscious evolution, there is distance between the artist and the work, allowing each composition to develop in its own way. 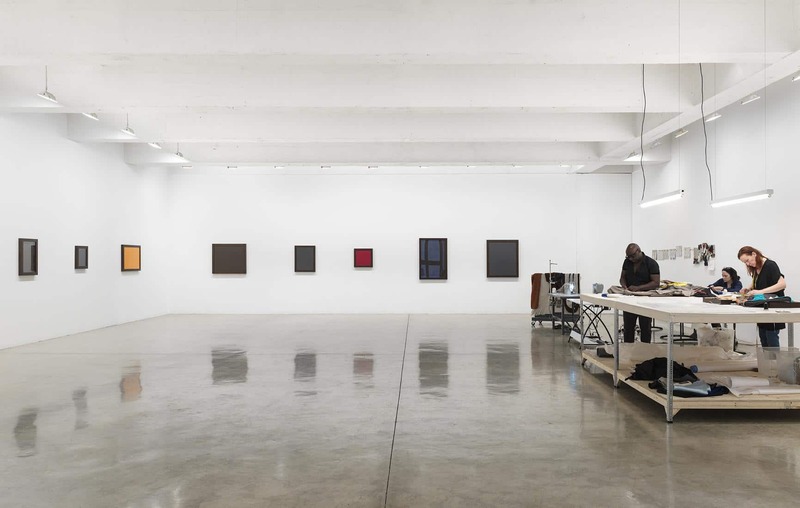 Installation view of “Painting with Light” exhibition at Yossi Milo Gallery. This excellent group show featured abstract, process-driven photographs as varied in appearance, process and meaning as photography’s more traditional forms of production. Being freed from its role of “record-keeper”, the medium of photography is reduced to its most essential and variable element: light. The standouts include New Zealand photographer, Ben Cauchi and Albanian- American photographer, Gjon Mili. Gjon Mili, “Picasso Space Drawing, France”, gelatin silver print, 1949. At Yossi Milo Gallery. 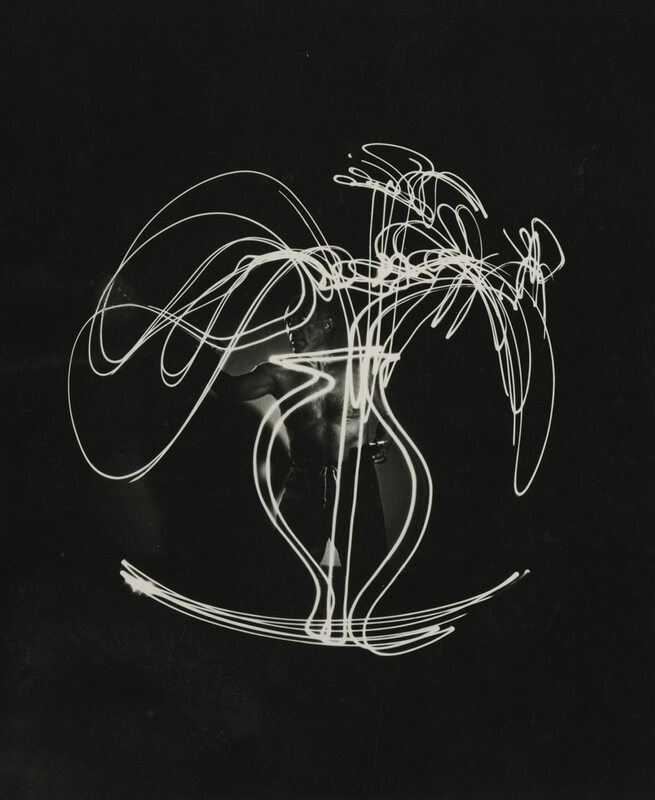 Gjon Mili collaborated with Picasso to make “light drawings” using strobe lights in 1949. Mili used long exposure shots to enact Picasso’s dramatic movements in space and time. Through photography, Mili captured these instantaneous drawings, which would have otherwise dissipated into the darkness within seconds, without any residual mark. 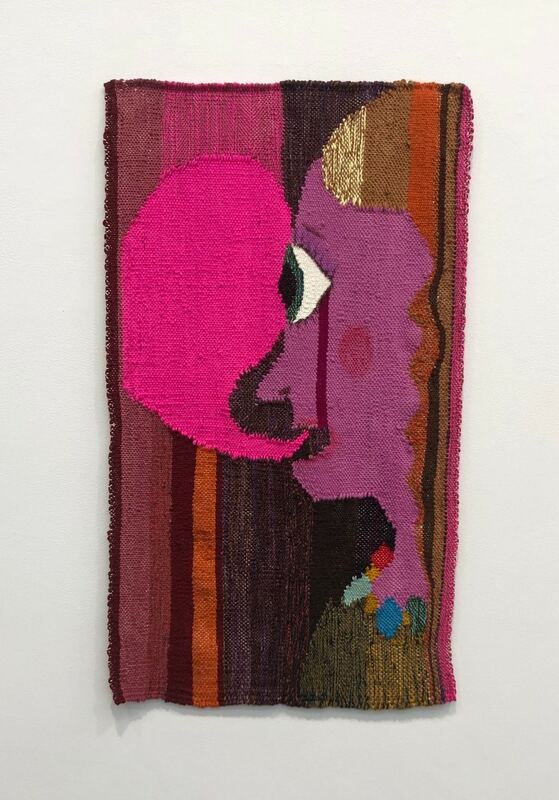 Christina Forrer (left) “Pink Bubble”, 2018, cotton, wool and ink. At Luhring Augustine. Forrer’s tapestries are fantastical, brutally honest and cartoonish. Her work is a searing exploration of conflict, which she perceives as being the very core of all relationships. 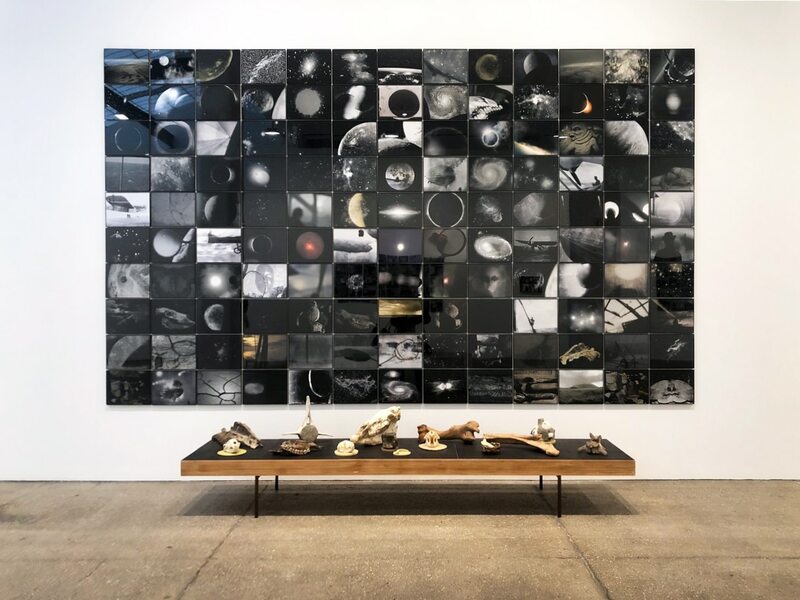 Michelle Stuart, “These Fragments Against Time”, 2018, Suite of 130 archival inkjet photographs and wood, beeswax, earth, rocks, sand, various fragments of fossilized shells, bones of various animals, including whale, horse, coyote, beaver, bird. At Galerie Lelong. Pioneering land art artist, Michelle Stuart’s show at Galerie Lelong was spectacular. The work combines found objects and artifacts with found photos that Stuart took from a boat at sea during the Solar Eclipse. The work comments on the passage of time, life and death. Manisha Parekh, “Indigo Cloud 4”, 2015, ink and watercolor on Arches paper. At Sundaram Tagore. Manisha Parekh, “A Secret Within”, 2008, jute rope and acrylic paint in 7 parts. At Sundaram Tagore. Image courtesy of the gallery. This group show at Sundaram Tagore, curated by Betty Seid, consisted of 11 abstract artists all with deep ties to the Indian subcontinent. 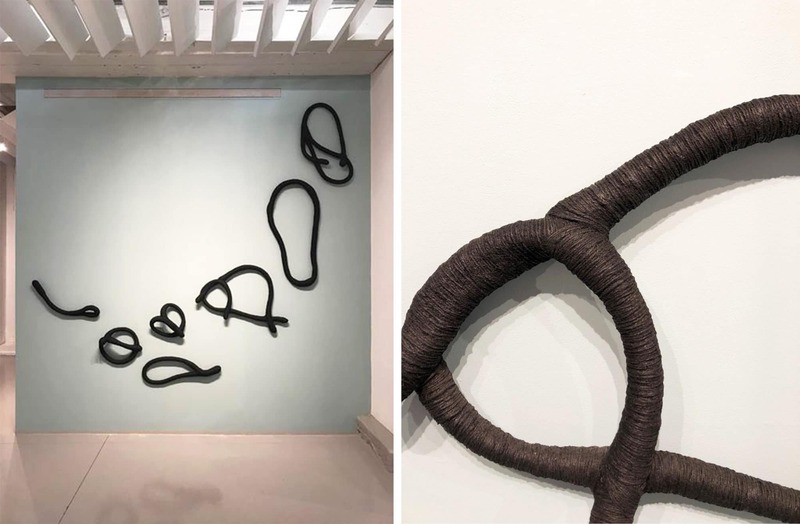 The standout works were by Manesha Parekh’s, who’s works are composed of materials including jute rope, silk, handmade paper and tea, her fluid abstractions often draw upon the craft and textile traditions of India. Installation view of Laura Lima’s, “I Hope This Finds You Well”, exhibition at Tanya Bonakdar Gallery. Image courtesy of the gallery. 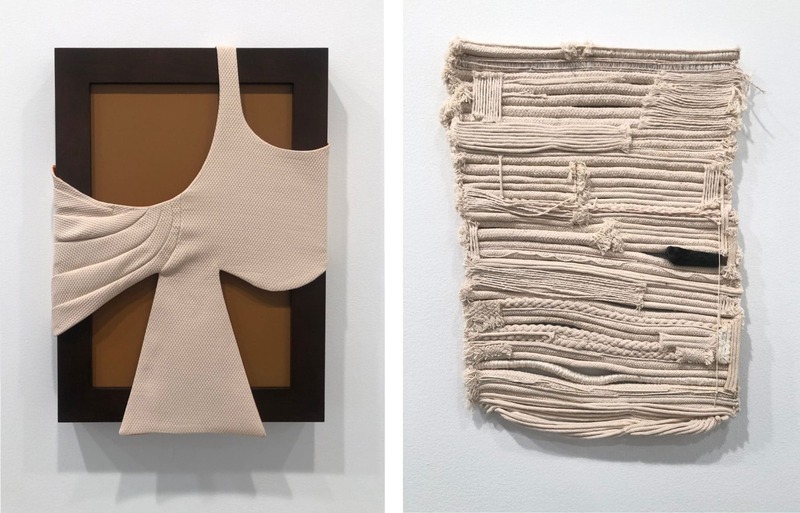 Laura Lima, (left) “Aracy”, 2019, fabric, thread and wood. (right) “Wrong Drawing”, 2040, cotton, coal and wood. At Tanya Bonakdar Gallery. This was Brazilian artist, Laura Lima’s first show in New York. In the gallery, there was a fully functional tailoring workshop. A team of local tailors worked to produce a collection of garments to “dress” Lima’s minimal drawings. Lima invited tailors to interpret her drawings and ultimately to complete them, creating a dialogue between artisanal labor and the art-making process. Limas rope works are composed of natural cotton with pieces of charcoal attached to them. Over time, the charcoal begins to dye the works. In a continual state of fluidity the works are dated far into the future, suggesting an eventual time when they may reach completion. Gabriel de la Mora, “1,660 I”, 2018, feathers and pigment on museum cardboard. At Perrotin. The unique methods and materials de la Mora uses, feathers, egg shells, and human hair, are a result of his exploration of alternative modes of art-making. The title of the work offers the first indication of a meticulousness as it reveals the works constituent parts. 1,660 I, 2018 enumerates the 1,660 colored feathers that comprise the image. de la Mora is interested in creating work that is made up of much more than meets the eye and is a complex assemblage of elements. Angel Otero, “Casting Light”, 2019, oil skins on fabric. At Lehmann Maupin. Otero has developed physically rigorous and experimental techniques to push the boundaries of painting. 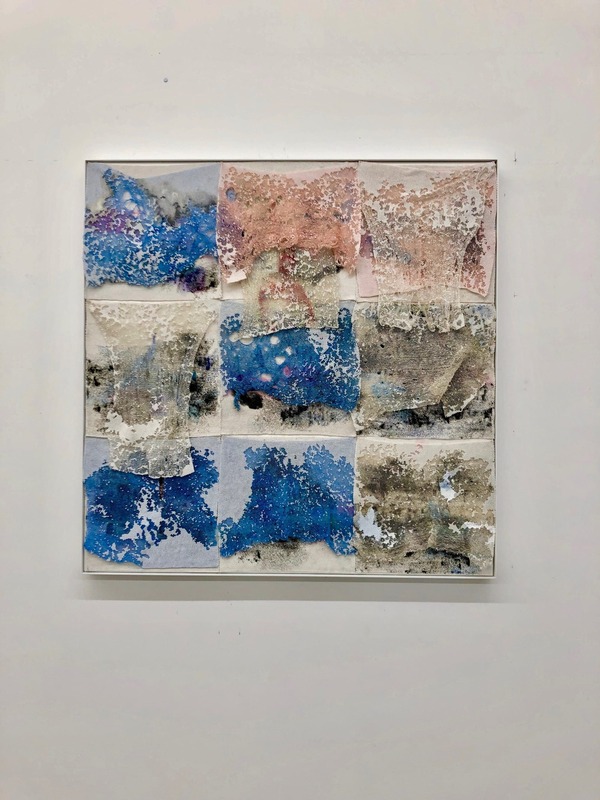 Through a methodically innovative process, the artist paints onto large sheets of glass, scrapes the partially dried oil paint from the surface, and then reassembles and collages the “skins” into multi-layered compositions. Kennedy Yanko, (left) “3”, 2019. (right) “Painting”, 2018, copper and paint. At Denny Dimin. Yanko searches salvage yards for materials that she then combines with paint “skins”. These “skins” allow her to use paint not only for its color, but as a structural material that stands in contrast to the industrial, manufactured components of the copper. Merlin James, acrylic and mixed media on canvas. At Sikkema Jenkins & Co.
James dedicates his paintings to the people in his life. The act of dedication highlights questions of audience and reception by specifying one privileged addressee. In a sense the work is even gifted to the dedicatee, without becoming his or her physical possession, and a question is raised as to what constitutes the true ownership of a work of art. (left) Alice Neel, “Ginny in Striped Shirt”, 1969, oil on canvas. (right) Diane Arbus, “Two ladies at the automat, N.Y.C.”, 1966, gelatin silver print. At David Zwirner, New York and Fraenkel Gallery, San Francisco (shared booth). 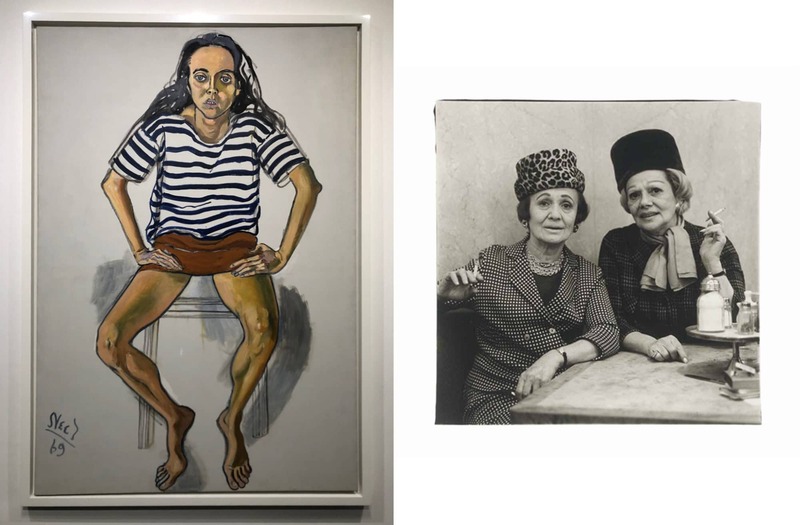 The highlight of the ADAA fair was Fraenkel Gallery and David Zwirner’s collaborative booth with painter, Alice Neel and photographer, Diane Arbus. The collaboration explored the unmistakable affinities between the two artists who were both working in New York City in the mid to late 19th Century. Although there is no evidence that they ever met, Neel and Arbus’s works share a visible intensity and complexity through the gaze and gravity that both artists conjured in their portraits. Susan Rothenberg, “Untitled”, 1990, oil on paper. At Sperone Westwater, New York. 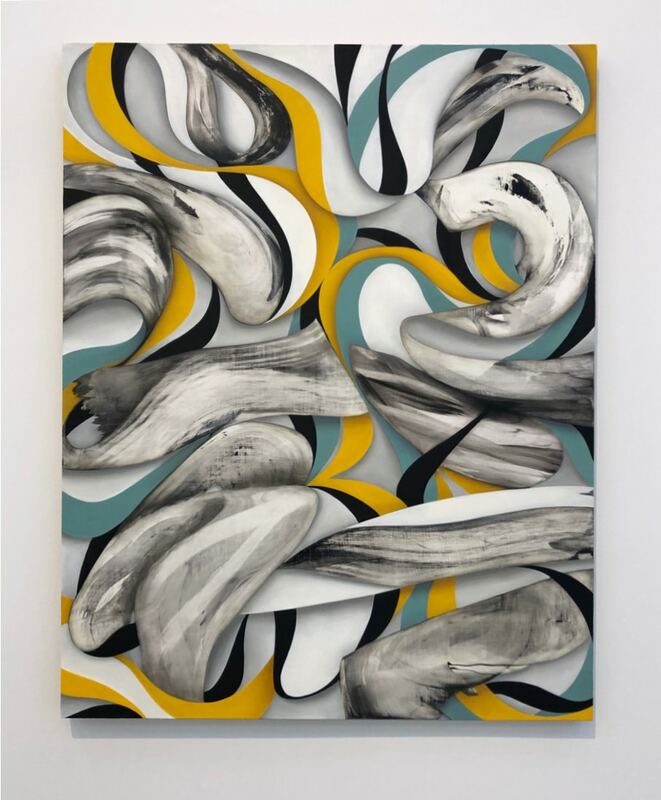 Rothenberg challenges and extends painterly conventions in her spatial and distorted compositions as well as in her exploration of light, color, form and movement. Juxtaposed against minimal yet heavily worked backgrounds, body parts become shapes, and the tension between figuration and abstraction is heightened. Henry Wessel, “Golden Gate Park”, 1982, vintage gelatin silver print. At Pace/MacGill Gallery, New York. Wessel has photographed scenes of the American West, in particular, California since the 1960’s. Wessel’s quiet, poetic and beautifully lit photographs capture the idiosyncrasies and irony of American life. 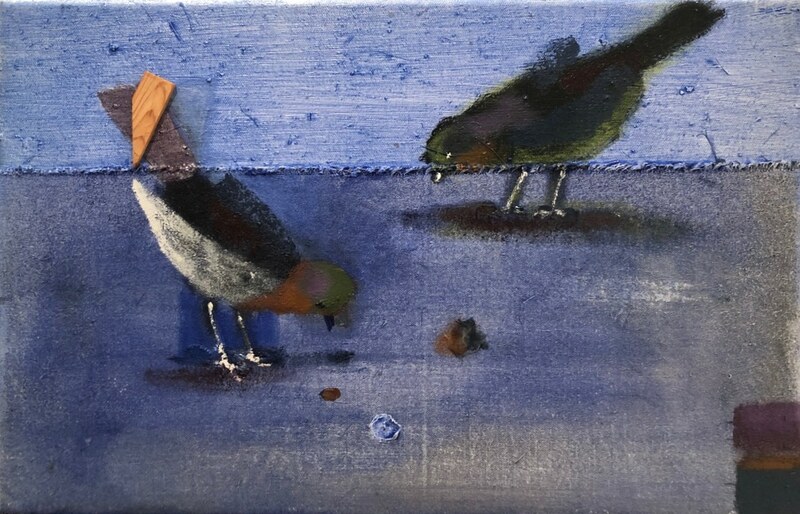 Robert Zandvliet, “Untitled”, 2018, egg tempera and oil on paper. At Peter Blum Gallery, New York. Dutch painter, Robert Zandvliet uses landscape as a conceptual frame of reference. 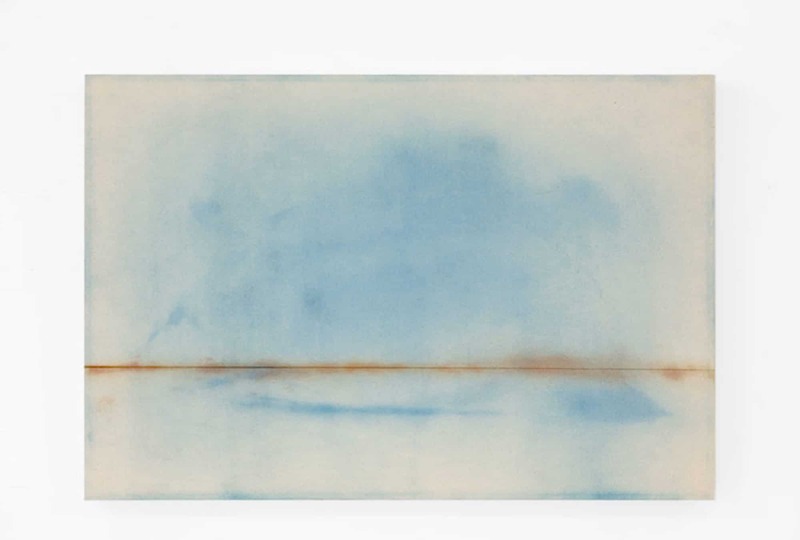 In these works, recognizable representations of a landscape have been replaced by a gestural play of lines, colors, and surfaces– the horizon has completely disappeared. Davina Semo, “THE STREETSCAPE BELOW MEANT NOTHING TO HER, HOWEVER MUCH SHE GAZED”, 2019, polished and patinated cast bronze. At Jessica Silverman Gallery, San Francisco. Semo’s abstractions are deeply rooted in the physical. 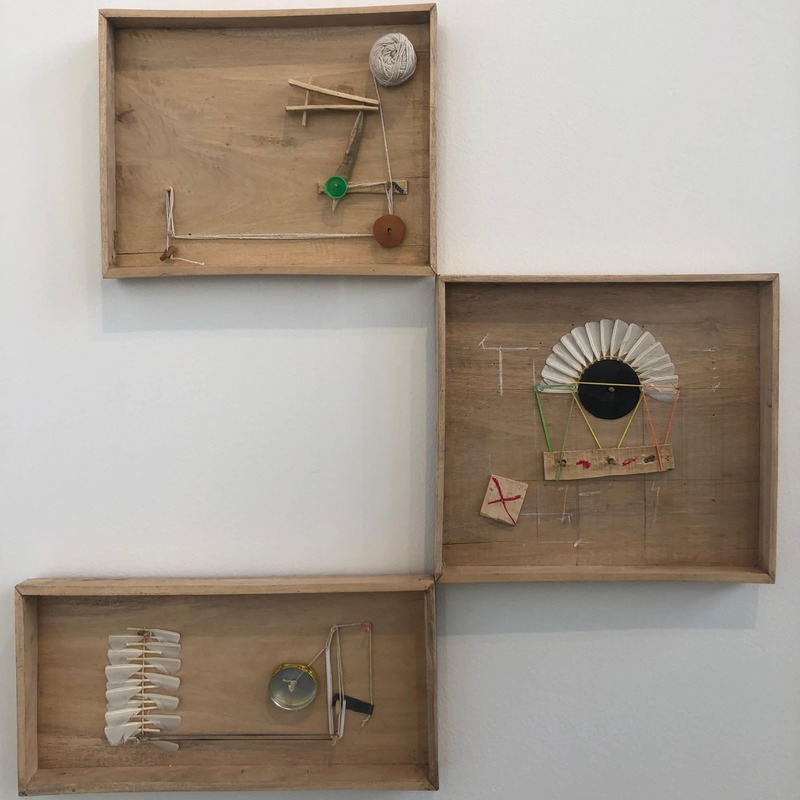 While these objects appear blank and impersonal—they could be confused for found objects from a construction site—Semo gives them grandiose all-caps titles that uneasily bridge the gap between humor and hysteria, therefore leaving their meaning unclear. Installation view of Fred Reichman’s oil paintings at The Landing, Los Angeles. Bay Area artist and Abstract Expressionist, Fred Reichman focuses on intimate spaces and addresses the subtleties of domestic scenery in delicate, washed tones. Reichman’s work is just as timeless and singular as when he painted it in the mid to late 19th century. Conny Purtill, “The Ground”, 2019, gesso, india ink and graphite. At Adams and Ollman, Portland. 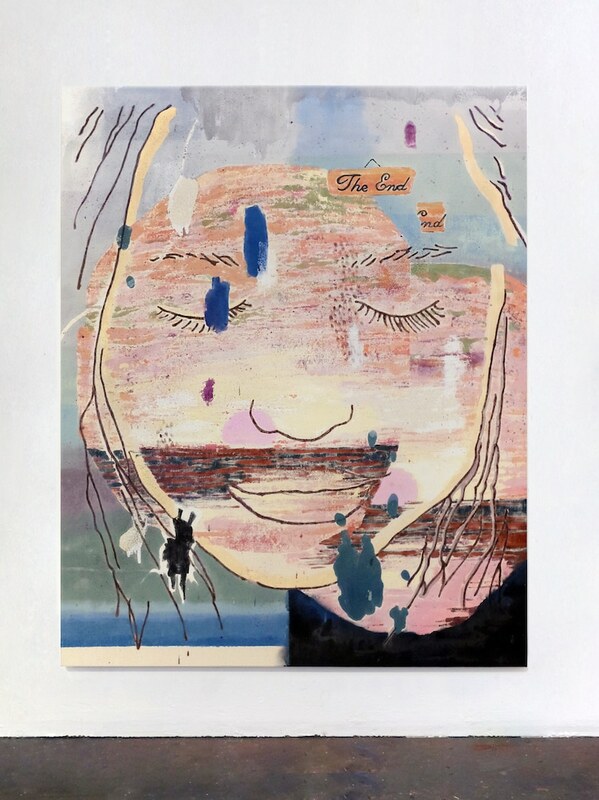 Purtill works primarily as a bookmaker and his artwork is often hidden in books. 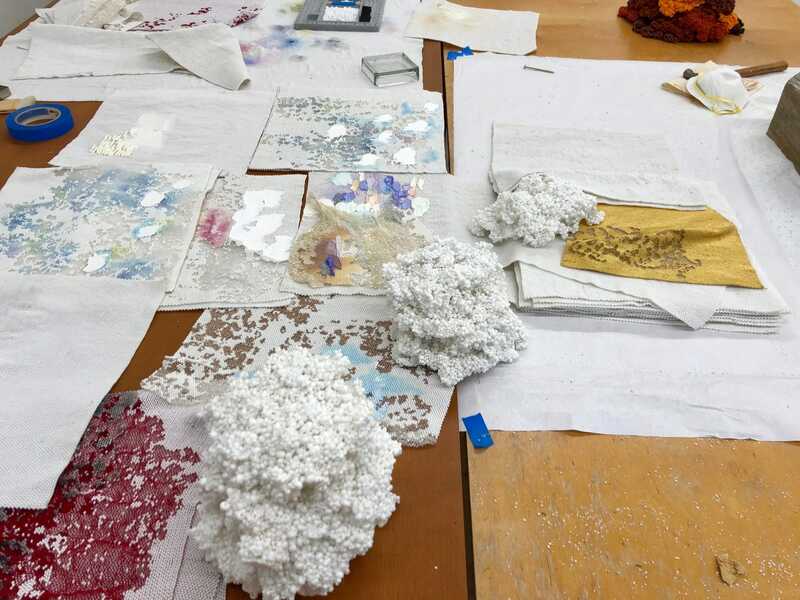 For these works, the artist used pages from a book, dyed them and took them apart to use as a surface to draw on. 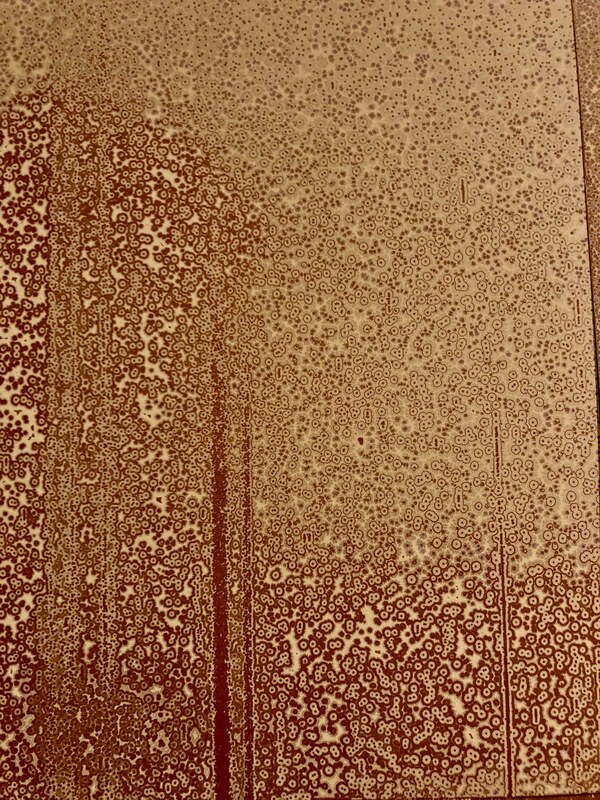 The mark making on the pages specifically relate to the landscape. In a collaboration, Purtill gave some of these blank pages to fellow artists to use as they wish and these were also on display. Goutam Ghosh, gouache, chalk and kite paper transferred on cotton textile glued on brown paper. At STANDARD (OSLO). Goutam Ghosh, “High Altitude”, 2016, painting feathers, nails, pains, wood and rubber band. At STANDARD (OSLO). Indian artist, Goutam Ghosh navigates the various influences of traditional Indian philosophies and rational sciences that he translates into an autonomous and poetic imagery that combines abstraction and figuration. His gestural, detailed and sign-like paintings are informed by a variety of disciplines including religion, magic, geology, music, and mathematics. 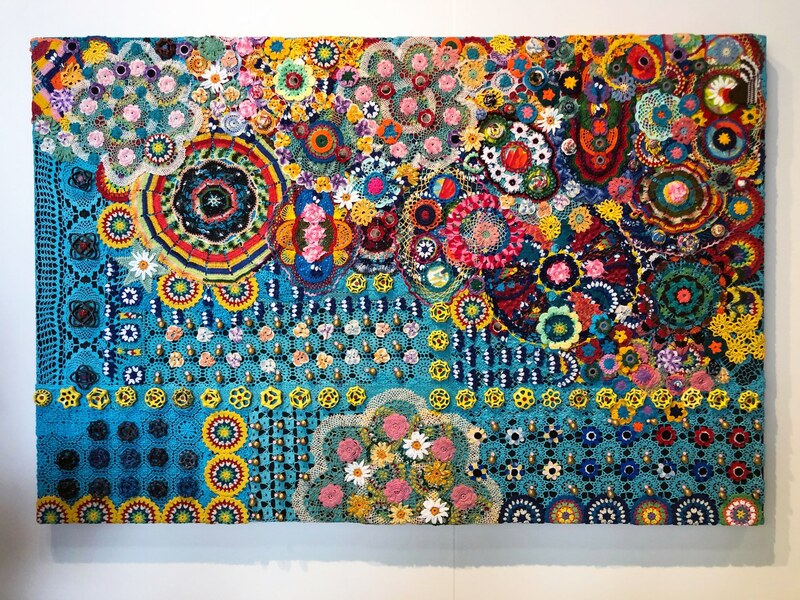 Zak Ové, “DP40”, 2018, crochet doilies, vintage lace and painted metal taps. At Lawrie Shabibi, Dubai. British-Trinidadian artist Zak Ové, seeks to reignite and reinterpret lost culture and mythology using new-world materials. Ove’s doily paintings are made from vintage European lace doilies as well as custom ones that have been made by Syrian refugees. The paintings, with their vibrant circular layers and patterns evoke the spirit and energy of the Trinidadian carnival. 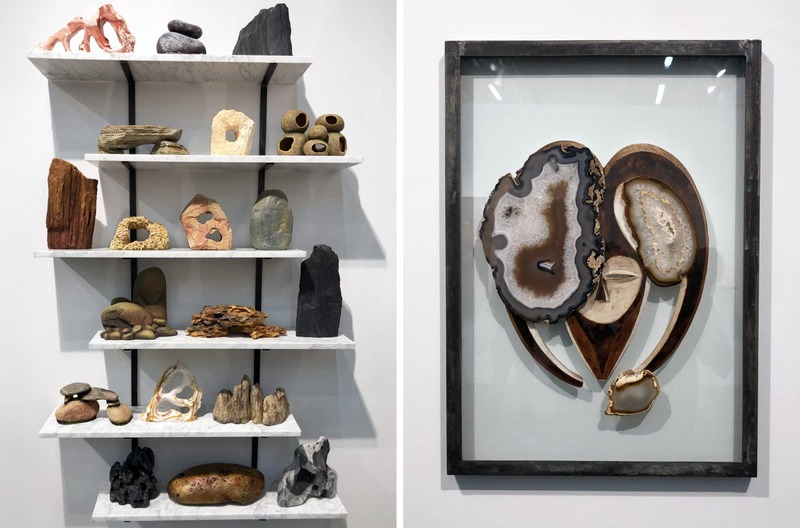 Théo Mercier, (left) “La possession du monde n’est pas ma priorité”, 2019, metal shelves, marble pannel, aquarium stones. (right) “Sans titre”, 2019, digital print, iron frame, glass, agate’s slices. At mor charpentier, Paris. Living between Paris and Mexico, Théo Mercier’s work is created through his relationship to the environment around him. He mixes his own sculptures with objects he has collected over time. These arrangements evoke a kind of archeology of the future. Riccardo Baruzzi, “Fioritura (San Francisco)”, 2018, pastel on linen. At P420 Gallery, Bologna. Italian artist, Riccardo Baruzzi’s work is structured around the physical and poetic principles of drawing and sound, specifically the rhythm and the movement of painting. View of Samantha Bittman’s booth at Ronchini Gallery, London. Bittman creates meticulous work that aims to stimulate the viewers’ visual perception and pattern recognition. She asks us the question of how much we really assimilate everyday. Bittman’s work is intended to slow the mind down and reveal visual phenomena without trickery, using basic shapes, symmetrical layouts, and pared-down color palettes. 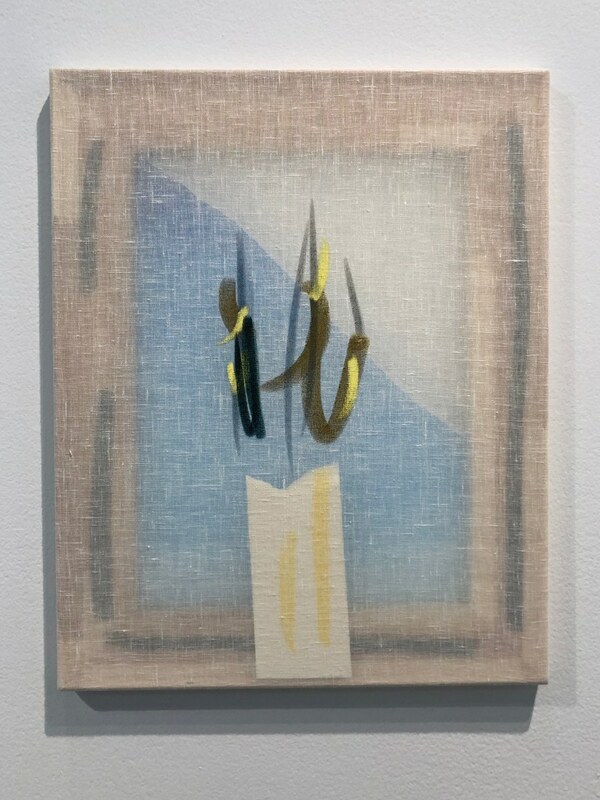 Chris Hood, “Snare”, 2019, alkyd and dry pigment on canvas. At Lyles & King, New York. Using staining and layering techniques, Hood creates surfaces of color and swirls of over-processed images of inconography. Botanical and floral motifs suggest a realm where one can loose oneself while also being rooted in the digital and screen-mediated world. 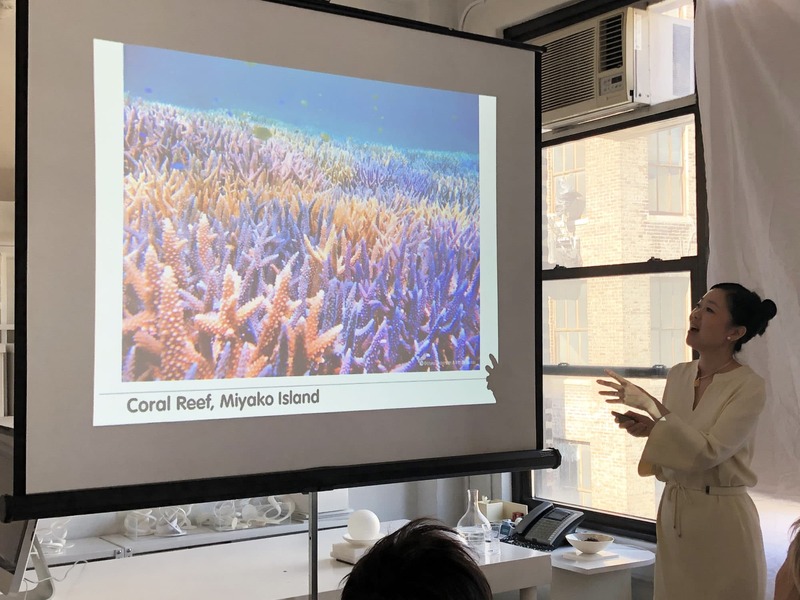 In conjunction with The Armory Show and in collaboration with Sean Kelly Gallery, we had an inspirational studio visit with contemporary Japanese artist, Mariko Mori. It was very interesting to learn more about her ambitious and spiritual practice as well as her FAOU Foundation. 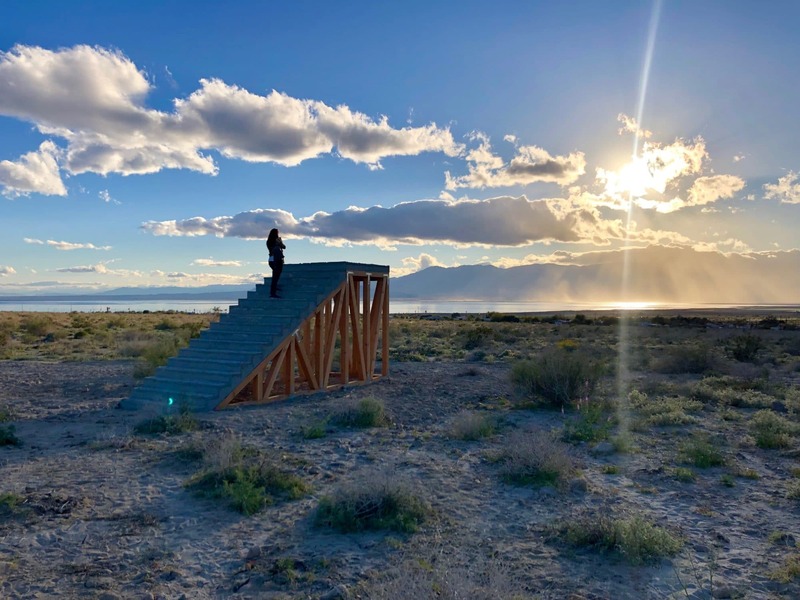 The foundation was created in 2010 as a monumental public project to create six site-specific artworks on each of the earth’s habitable continents to promote environmental awareness of the balance between humanity and nature. Mori’s practice explores universal questions at the intersection of life, death, reality, and technology. 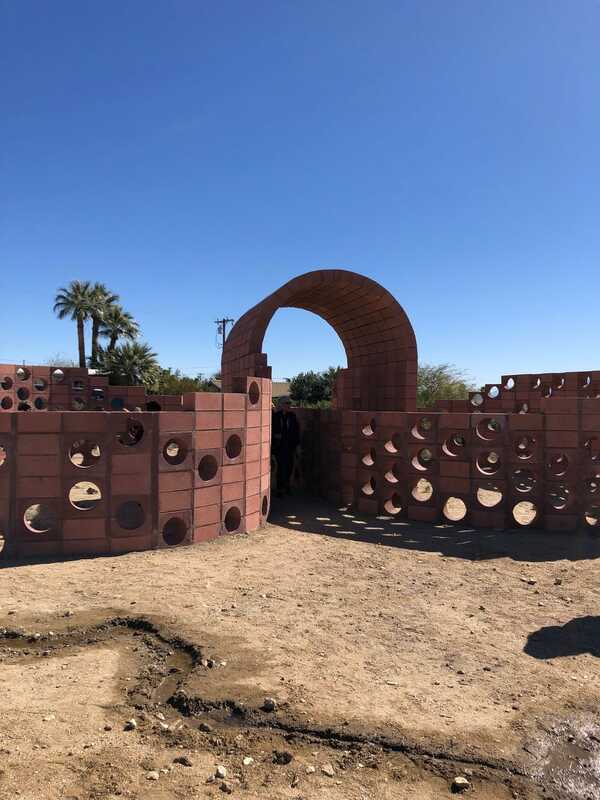 Desert X – Following are our favorite pieces from this site- specific outdoor art exhibition in Coachella Valley. 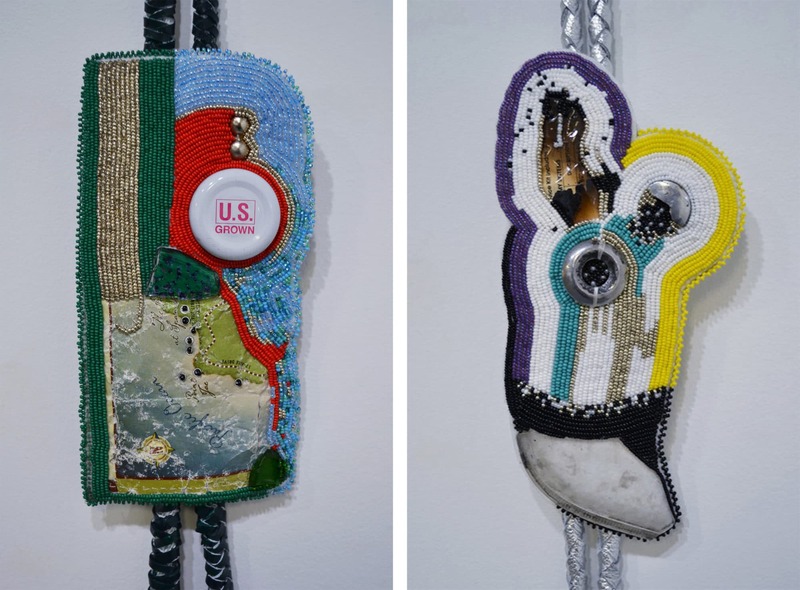 Meant to bring attention to the valley’s environment through the display of works by established and emerging artists, themes in the exhibition include climate change, immigration, tourism, gambling, and Native American culture. We felt the most successful pieces were the ones that were about the place they were located in. 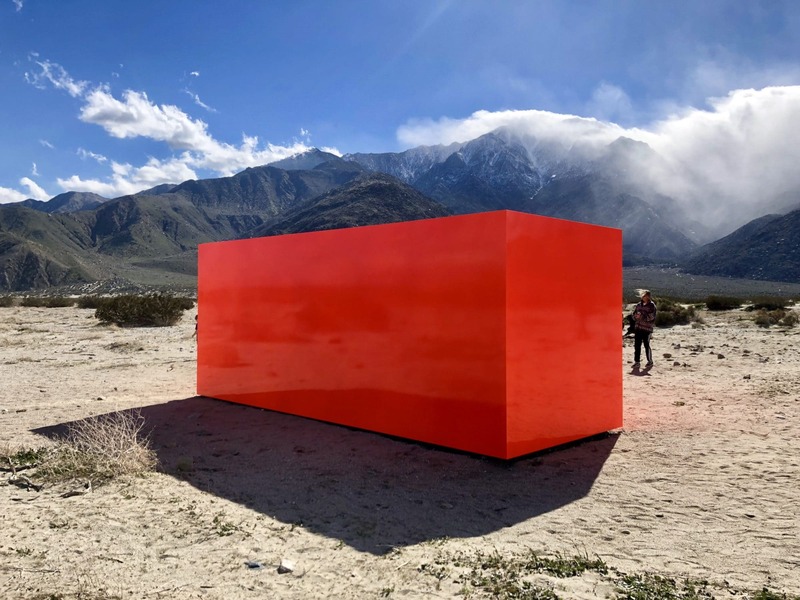 Sterling Ruby’s fluorescent orange monolith, appears as a shadow in the desert. The bright, geometric sculpture creates a jarring optical illusion as if something has been removed or erased from the landscape. The block acts as a stand-in, mimicking the form it could embody — a shipping container, a military bunker, an unidentified object, an abandoned home-stead. Fluorescent orange is traditionally used for safety, as a warning. Here that logic is reversed: a ghostly object, set apart from the natural environment, hiding in plain sight. 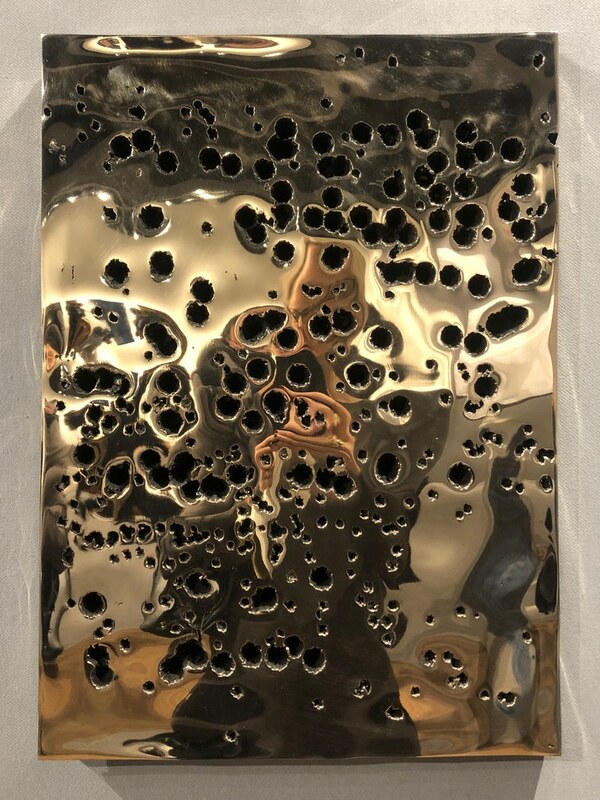 Iván Argote, “A Point of View”, 2019. 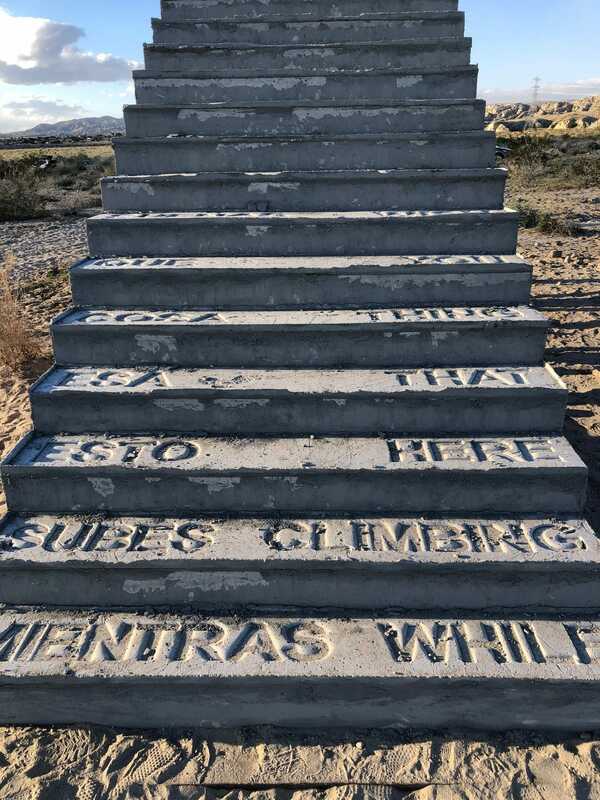 This interactive sculpture created by Bogotá-born/Paris-based artist Iván Argote is installed at an elevation above the Salton Sea, the manmade body of water which has been California’s largest lake for the past century. There are 5 concrete staircases that project the viewer into the landscape, some facing each other, some facing out. Poetry raising questions about ownership and territory are set in concrete appear in Spanish and English upon each step. This was our favorite piece as it highlighted the beauty of the surrounding location, and provided a place for contemplation. Julian Hoeber, “Going Nowhere Pavilion #01”, 2019. Julian Hoeber, “Executed Variant DHS #1 (Q1, CJ, DC)”, 2019. In correspondence with Hoeber’s other installation, “Going Nowhere Pavilion #01”, The painting in the pool and is connected to the property surrounding it. The painting, like the pavilion, is an image of the mind in its own way: the painting is a study of phenomenological consciousness. Both the pavilion and the painting attempt to parse out how forms can represent the logical, irrational, historical and corporeal experiences of human consciousness. Cara Romero, “Jackrabbit, Cottontail & Spirits of the Desert”, 2019. Driving down Gene Autry way you pass a series of photographs on billboards by artist Cara Romero. 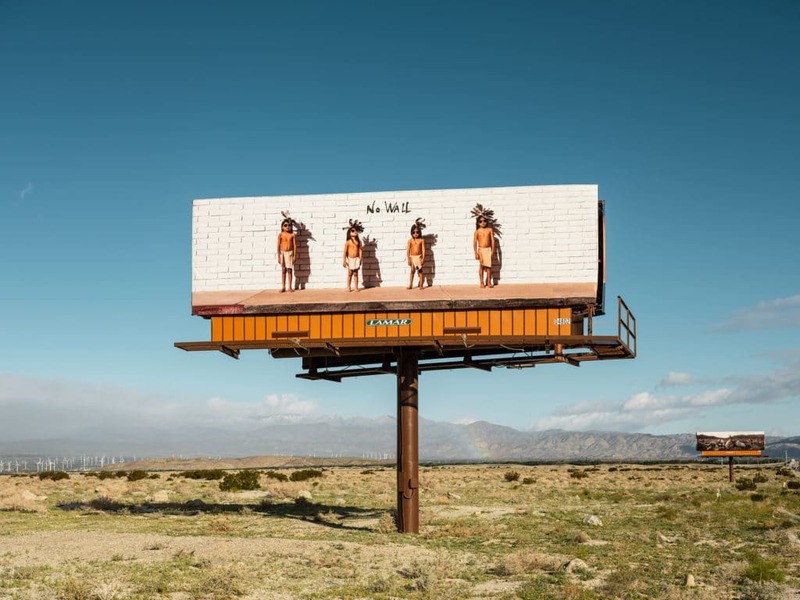 The photographs on the billboard respond to the ancestral lands of the Cahuilla, Chemehuevi, Serrano, and Mojave people. This image features four special time-traveling visitors from Chemehuevi who have come to the ancestral lands of their sister tribes in the Coachella Valley. In Romero’s vision, these small but mighty figures have returned to remind us of our deep connections to the land, the stories contained within it, and how we can live in relation to it. The photograph is a manifestation of an oral tradition, bringing visibility to the individuals, cultures, and history that continue to inform the landscape. Palm Springs Art Museum – The powerful exhibition, “Unsettled” looks to the future while also honoring the past and those who created cultures and places millennia before it was declared ‘unsettled.’ The work created in the exhibition explores the geography of vast frontiers, rich natural resources, diverse indigenous peoples, and the inevitable conflicts that arise when these factors coexist. These terra cotta plates filled with dry pigments, spices and salts offer a variety of colors, scents and patterns to create an immersive sensory experience. The installation speaks to the ways in which regions are interconnected through foods and spices rather than arbitrary geopolitical borders. Ed Ruscha, “Chocolate Room”, 1970- 2004. Ruscha uses chocolate as a material for art- making. 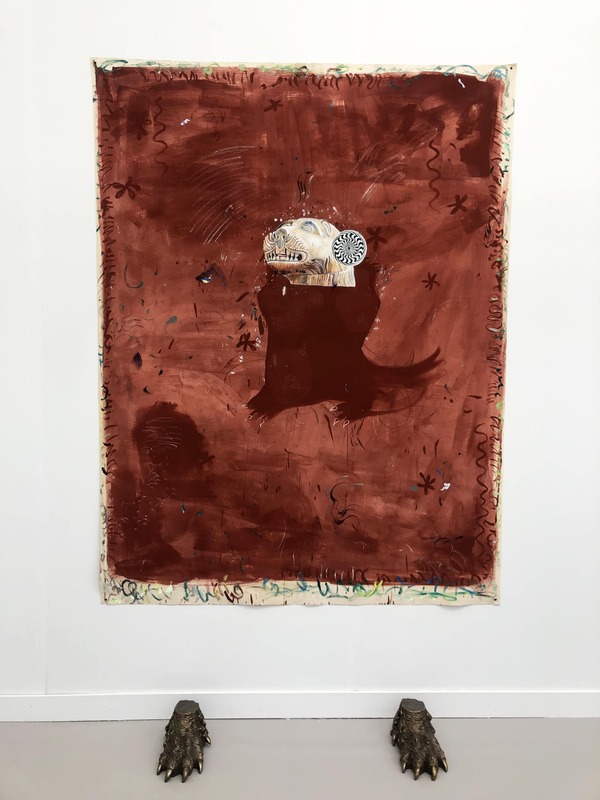 By painting tiles of paper with chocolate and installing them across the gallery walls, he creates a sensory experience that responds to the origins of cacao beans. The Olmecs (before the Spanish colonization of the Americas) and the Mayans used it as a ceremonial drink and aphrodisiac for hundreds of years before the Europeans discovered it in the seventeenth century and transformed it into what we know it as today. Guillermo Bert, “Zapotec Poet”, 2015. This tapestry is made with wool and natural dyes and is encoded with Aztec bar codes. 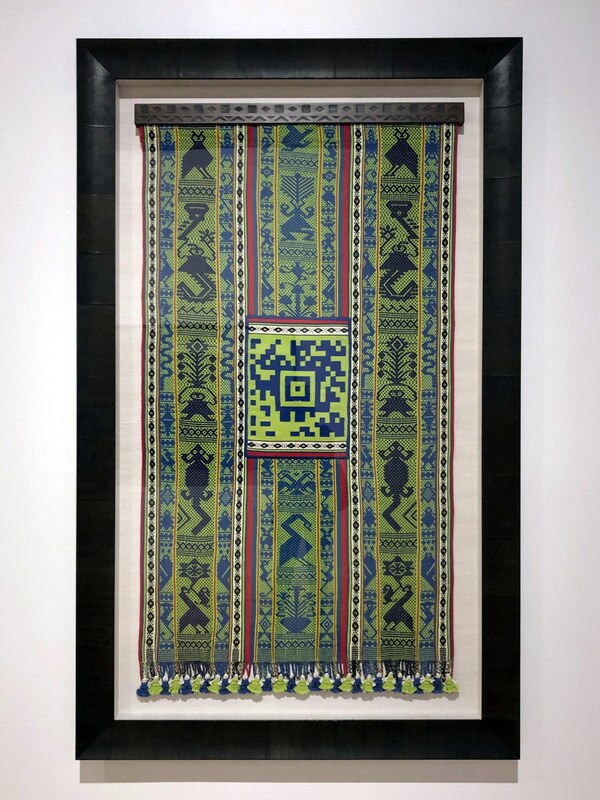 Bert collaborates with traditional Mapuche, Navajo, Maya, Mixtec and Zapotec weavers in Chile to weave bar codes that, when scanned with a smartphone,”de-code” cultural messaging and create a bond between the distant viewer and the intimacy of the community of indigenous artists and storytellers. Brian Jungen, “1980, 1970, 1960”, 2007. Jungen’s work is inspired by his repulse of the professional sports industry. This work is a response to the cult-like embrace of sports paraphernalia by fans and the industry’s adoptions of names such as the Redskins or the Braves to denote fierceness and bravery. 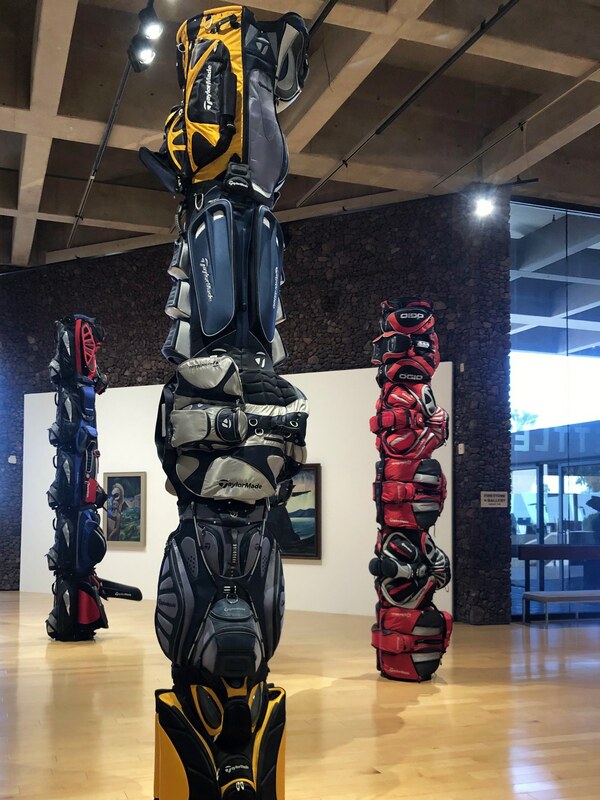 Jungen’s sculptures are made from golf bags that were re-purposed into forms that resemble Northwest Coast totem poles. Brian Jungen, “Prototype for New Understanding #23”, 2005. Jungen is of mixed Dunne-za (Beaver) and Swiss background. 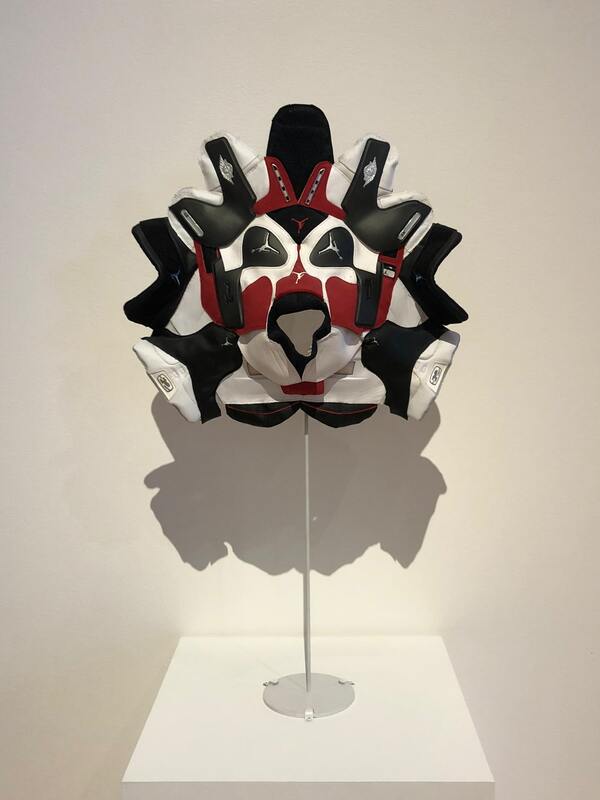 The sculpture is made from Nike Air Jordans that were refashioned to resemble an Indigenous Northwest Coast mask. Nicholas Galanin, “Thing Are Looking Native, Native’s Looking Whiter”, 2012. 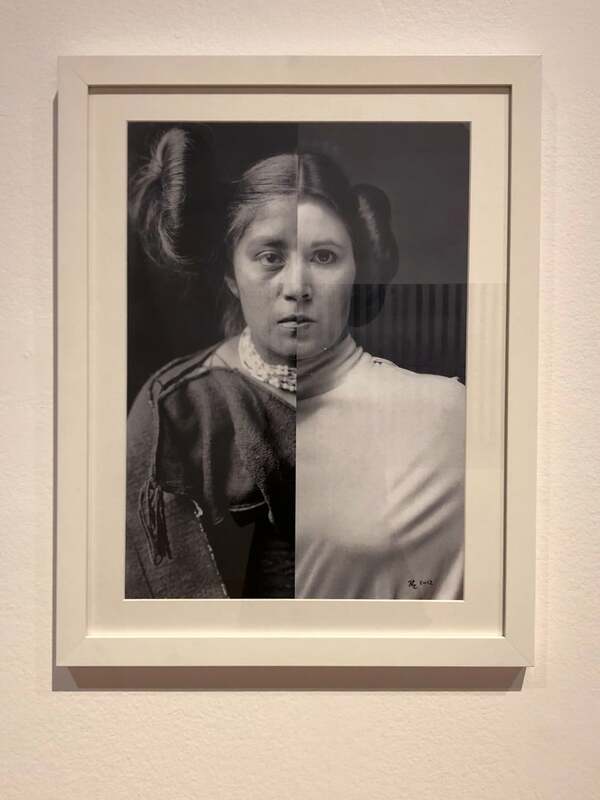 This culturally appropriated black and white image, split down the center, features Princess Leia from the 1977 Star Wars on the right and photographer Edward Curtis’s A Tewa Girl (1906) from the well- known photographic series The North American Indian (1907-30). The Tewa girl, a Pueblo Indian native of the Rio Grande region of the southwest, wears her hair in a large bun that bears an uncanny resemblance to Leia’s futuristic bun, indicating the adoption and absorption of selected elements of Indigenous culture by the dominant group, in this case the American film industry. Nicholas Galanin and Nep Sidhu, “No Pigs in Paradise”, 2016. This gown made in collaboration is dedicated to missing and/or murdered First Nations women. The textile and hand-engraved metal adornments are met with a contemporary elements of the quilted puffer jackets– a reference to missing persons reports, which often state that the missing woman was last seen wearing a winter jacket. This gown is meant as a symbolic garment for modern ritual and protection. 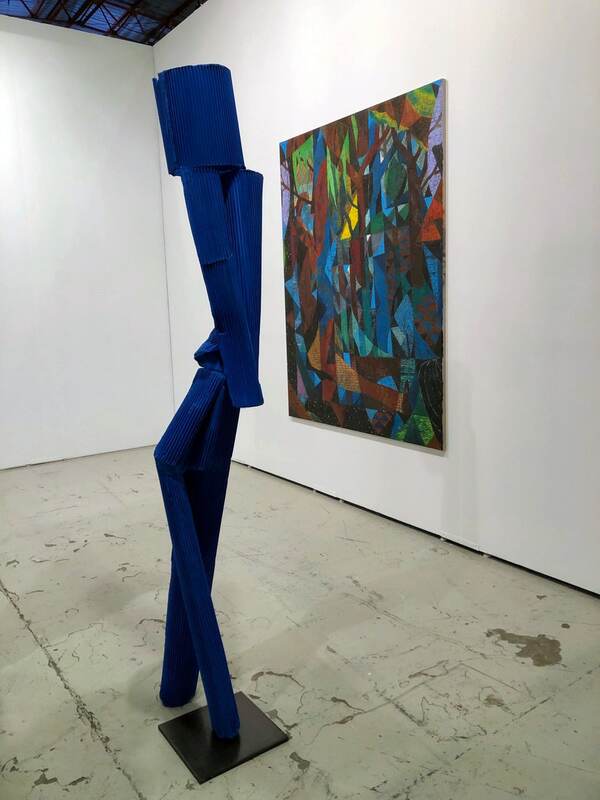 Art Los Angeles Contemporary (ALAC) – ALAC held its 10th annual fair, exhibiting galleries from around the world. 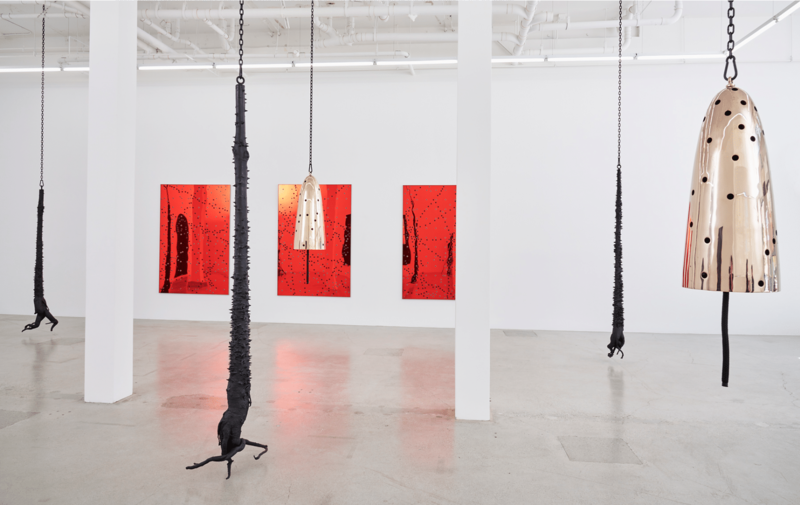 Abdolreza Aminlari installation view at Situations Gallery, New York. 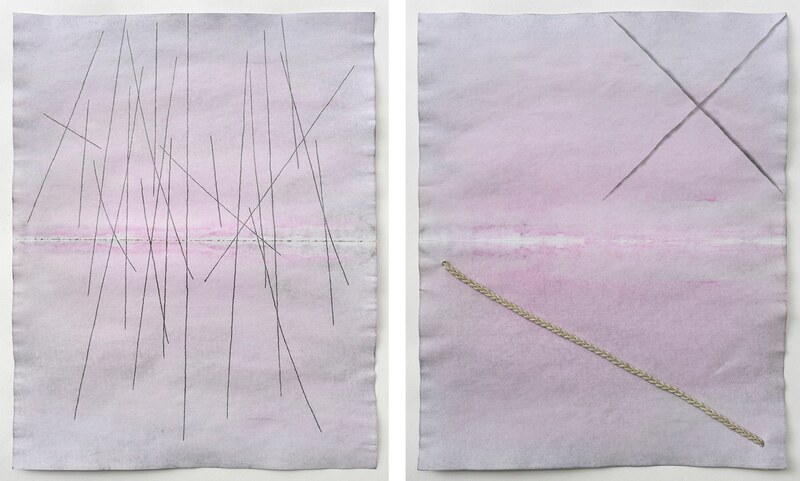 These metallic thread on paper works are based on the wages equivalent to one day’s work. 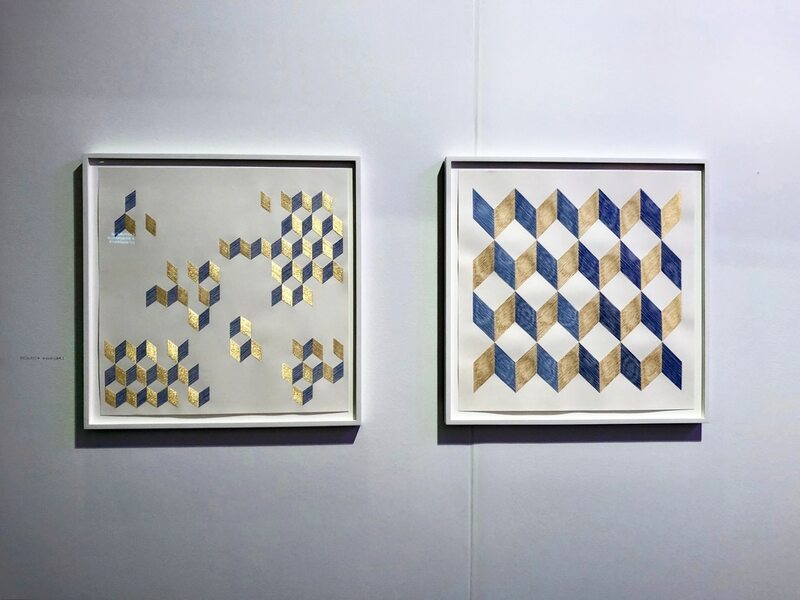 Exploring the intersection of contemporary craft and social practice, Aminlari employs geometry and abstraction with a rhythmic intensity matched by ideas surrounding the transnational dissemination and intercultural reception of embroidery, the color blue, and labor. Wang Hao, “Remote”, 2017 at 10 Chancery Lane Gallery, Hong Kong. By creating work using the color grey, Hao’s work attempts to locate a purified spiritual world in the current state of life. He uses the Eastern trait of “inner beauty” through the minimalist color of grey and the rich material texture of his work. Gray represents everything as it is the sum of all colors. 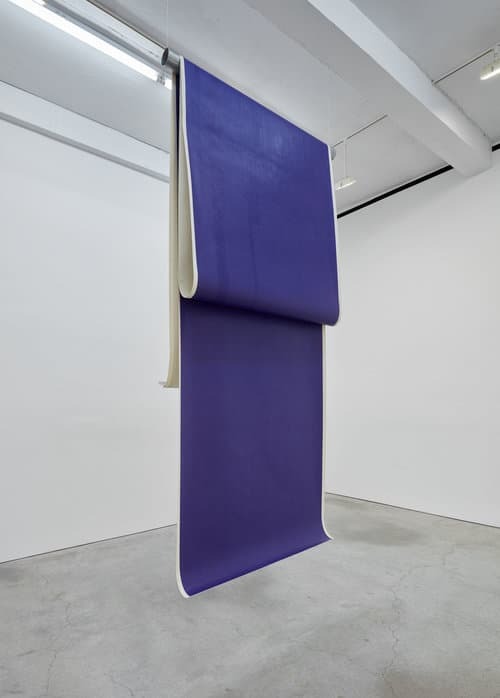 June Edmonds, “Browning & Bluing Flag”, 2018 at Luis de Jesus, Los Angeles. June Edmonds’ vibrant, confidently impasto paintings of radiant color are like controlled bursts of psychic energy. Edmonds describes her work as “a doorway to memory”. The work has visual similarity to the dot-paintings of the indigenous Australians – the longest continuous visual art tradition operating in the world today. Henna Vainio, “Legs (blue)”, 2019 at Josh Lilley Gallery, London. Henna Vainio uses sculptural casting as a method to reproduce everyday objects often resulting in the creation of seemingly natural looking, human-like forms. Her methods invoke the sense of casting in the theatrical sense of the word, as through the act of reproduction, the objects are assigned new roles or cast into performative functions. Frieze Los Angeles – A branch from Frieze London and New York, this newly announced contemporary art fair offered insight to 70 galleries from around the world inside a custom made structure designed by architect Kulapat Yantrasast for the fair. 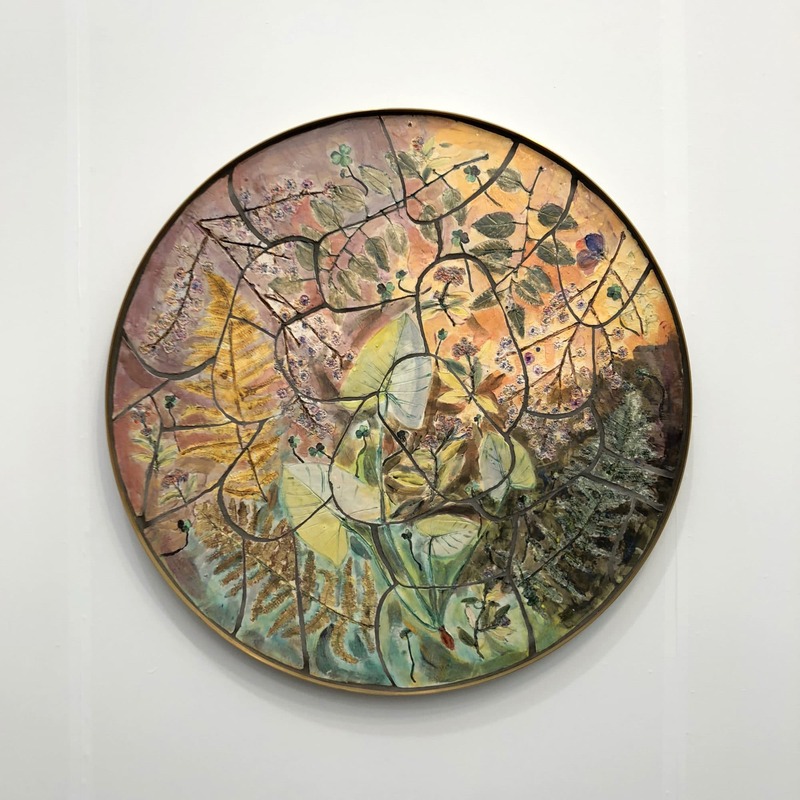 Sam Falls, “Untitled (Fern Dell, 1)”, 2019, at Galerie Eva Presenhuber, Zürich. Falls boundary-defying work applies artistic processes to natural phenomena. He often inserts organic structures into art and man-made objects into nature. Hayley Tompkins, “Digital Light Pool”, 2018 at The Modern Institute, Glasgow. These multi-colored are paintings in photographic development plastic trays. Bearing a resemblance to landscapes, they are rendered in a multitude of hyper hues. 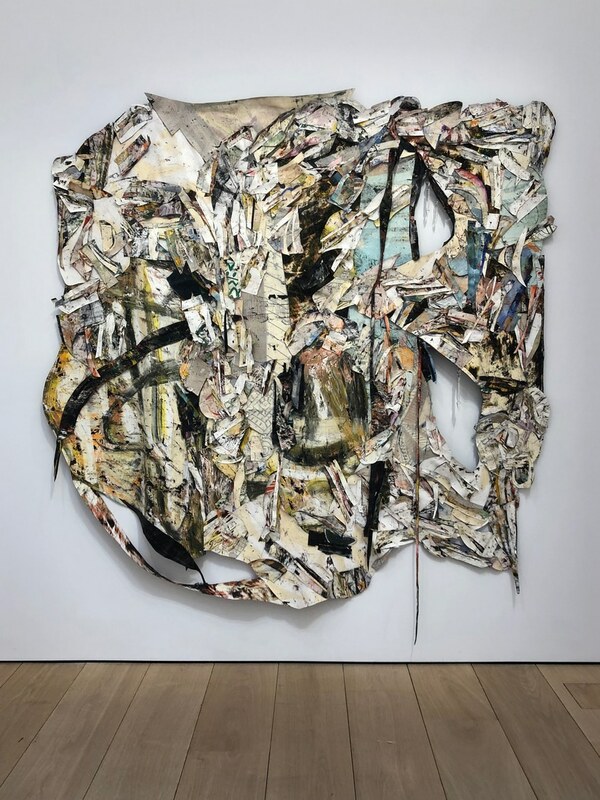 These sceneries are built with Tompkins manipulation and layering of paint, a practice that democratically employs and values both the premediated and the unpredictable. 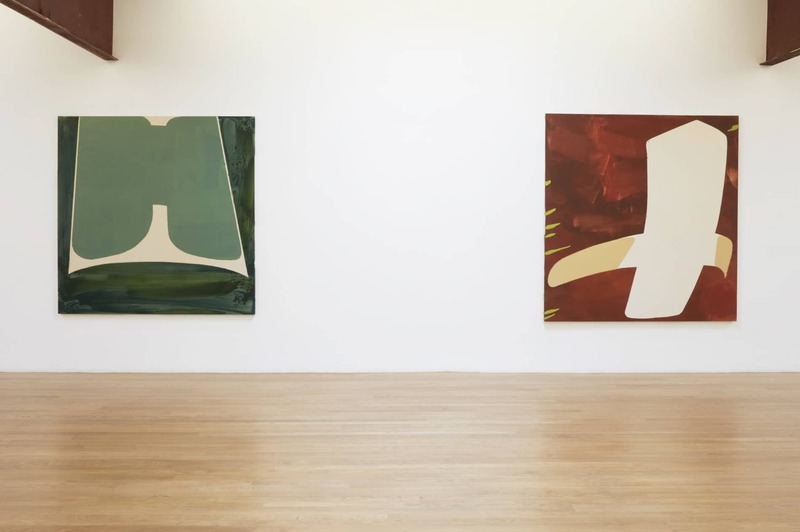 Hurvin Anderson, “Maracas Series”, 2010, at Thomas Dane Gallery, London. 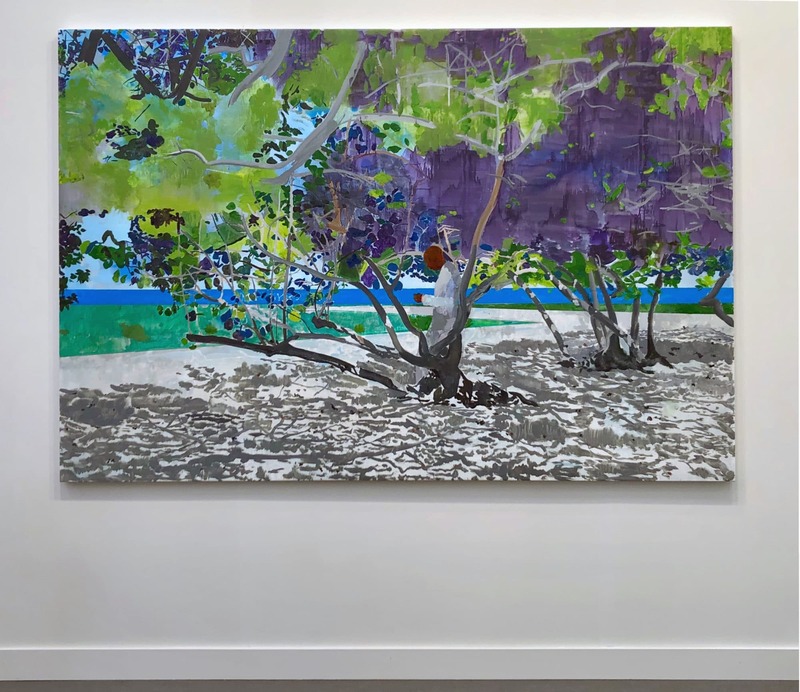 Anderson is a British painter who explores his Jamaican heritage through depictions of verdant Caribbean landscapes, tangled into abstractions rich with cultural references. His work sheds light on the complexity of growing up in England while desiring to reconnect with familial roots. 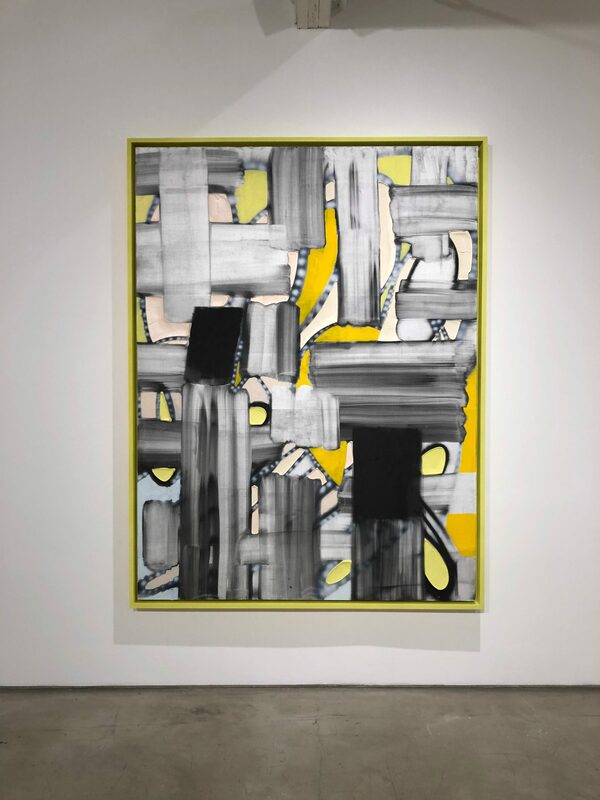 Marley Freeman, “Reciprocity can create a lot of space” and “Expose something lurking”, 2016-19, at Parker Gallery, LA. Freeman’s intimate paintings, small, abstract and gem-like, are an accumulation of layers with varying degrees of opacity and luster. The colors, hand-mixed acrylics or oil paint and slapped onto the canvas at a rapid clip, are anomalous and unexpected, contemporary and vintage in feel. Paulo Nimer Pjota, “Sou leão, Sou Demais Pro Seu Quintal”, 2018 at Mendes Wood DM. Pjota is interested in the processes and mechanisms that produce, edit and disseminate human expressions during a time that is dominated by the internet and ultra-communication. Through rhythm, rhyme and repetition, images arise, which index the common perceptions of a globalized planet and, consequently, expose deep inequalities. 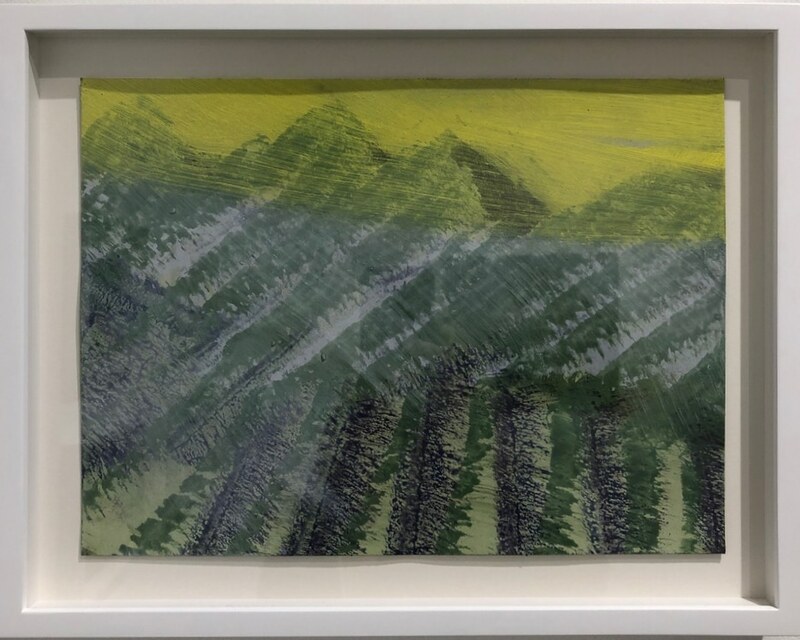 Wyatt Kahn, “Untitled (Green)”, 2019, at Galerie Eva Presenhuber, Zürich. Kahn investigates the visual and spatial relationship between painting and sculpture. 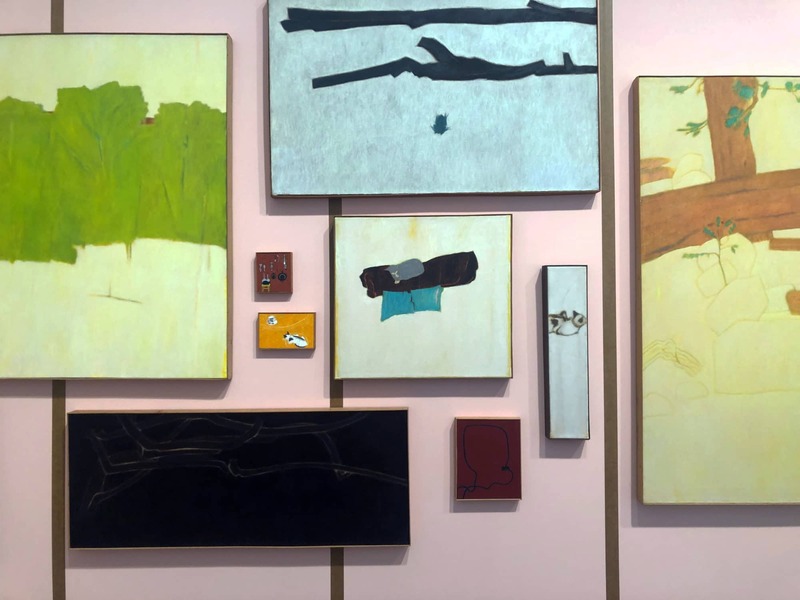 Using unprimed canvases stretched over wooden frames, he assembles complex wall-mounted works in which the gaps between the individual canvases give rise to abstract or pictorial compositions. Rather than tracing the lines and shapes directly onto the canvas itself, he turns them into physical components of the artwork. Referencing the tradition of minimalist abstraction, Kahn’s work is informed by a desire to explore non-illusory forms of representation. 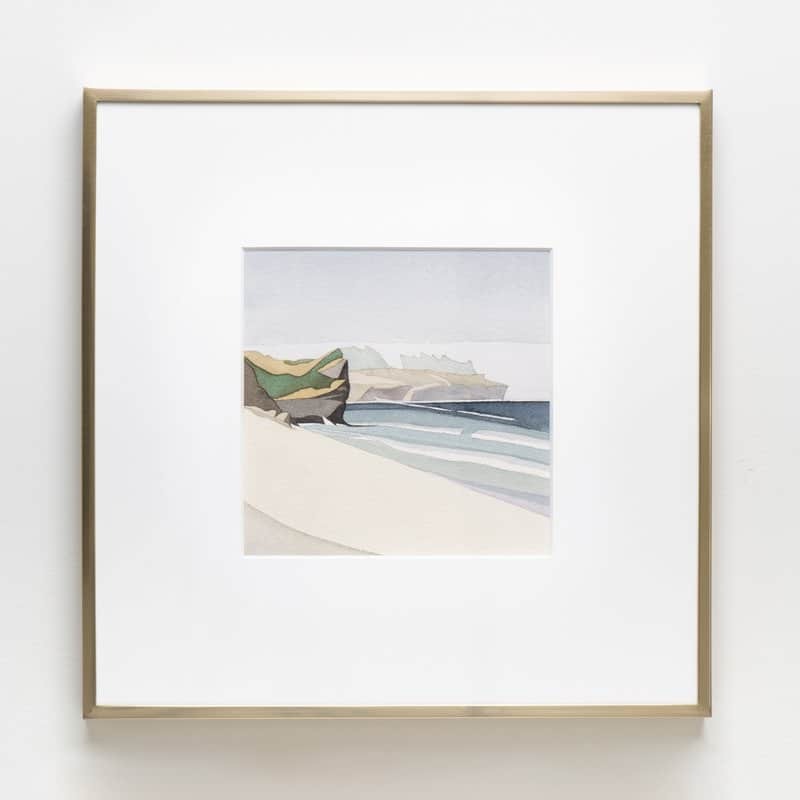 Hannah Greely, “High and Dry”, 2019, from Parker Gallery, LA. Inspired by the efficiency of a doodle or sketch, Hannah Greely makes three-dimensional works enlivened with the idiosyncrasies of drawing. 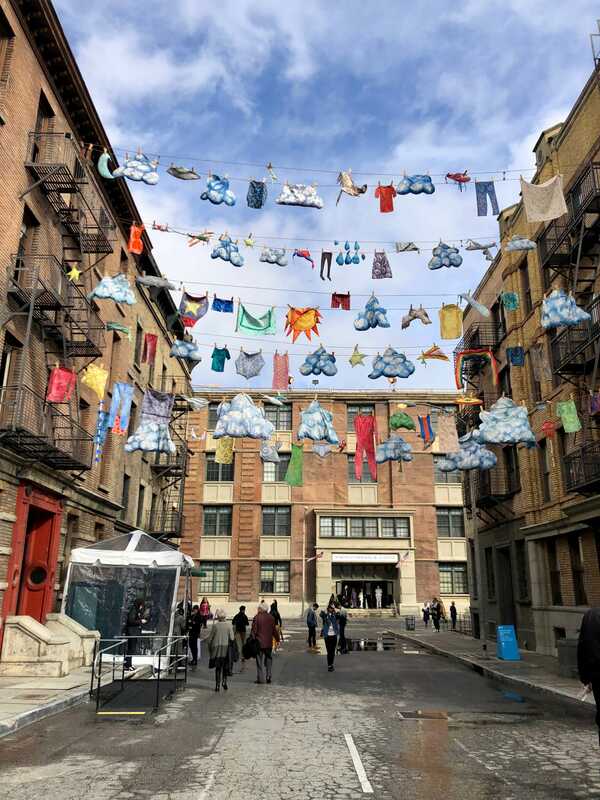 Suspended from clotheslines spanning the fire escapes and windows of two apartment buildings, Greely’s hand-made, cartoon-like paintings of clothing items, as well as objects seen in the sky such as clouds and helicopters, enhance the simulated environment adding an extra layer of make-believe and wonder. Sarah Cain, “I touched a cactus flower”, 2019, from Honor Fraser, LA. Sarah Cain constantly seeks out alternate modes and surfaces for painting. 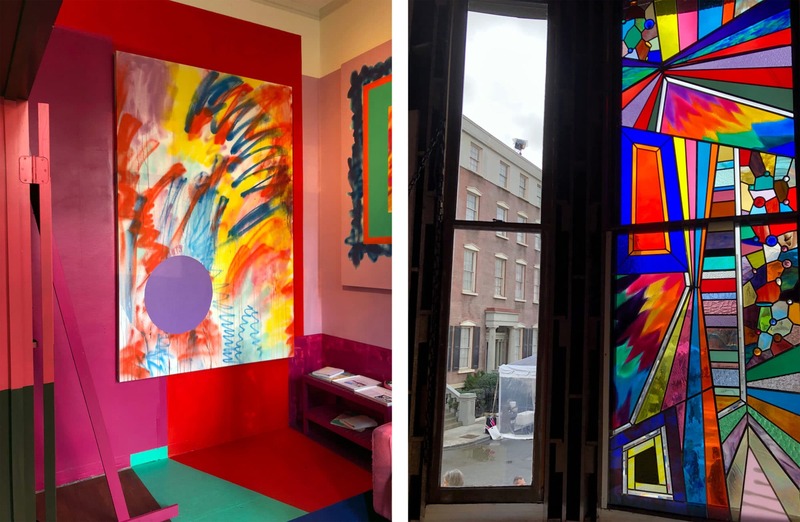 Cain continues her anarchic approach by transforming the set of a classic New York City brownstone apartment, into an immersive installation featuring her signature style of abstraction, as well as a new work in stained glass. Kylie White, “Kilifi Beach”, 2018. Installed in the backroom at Moskowitz Bayse. Kylie White installation view at Moskowitz Bayse. 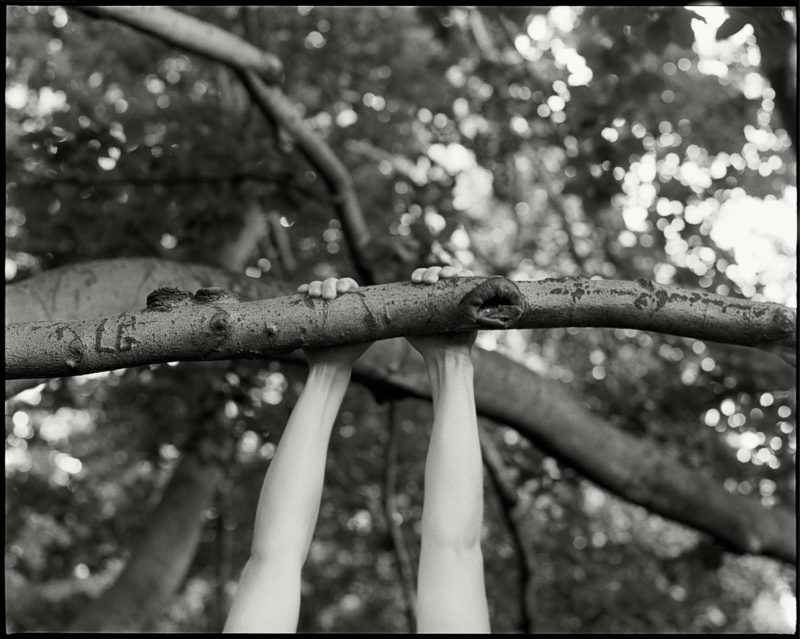 This exhibition, “Six Significant Landscapes” at Moskowitz Bayse is an exhibition of new works by Kylie White. White’s works are sculptures, scale models, geologic diagrams, and proposals; each depicting an active fault line, a place of displaced terrain due to tectonic movement. The sculptures rely on modern science to determine their forms and modern tools to generate them, yet allude to something ancient and sublime: humans amidst the immensity of the landscape. Andrew Bowers, “We Are the Storm and We Will Leave Light in Our Wake” at Susanne Vielmetter Los Angeles Projects. This work was part of Susanne Vielmetter Los Angeles Projects inaugural exhibition for their new space in Downtown LA. 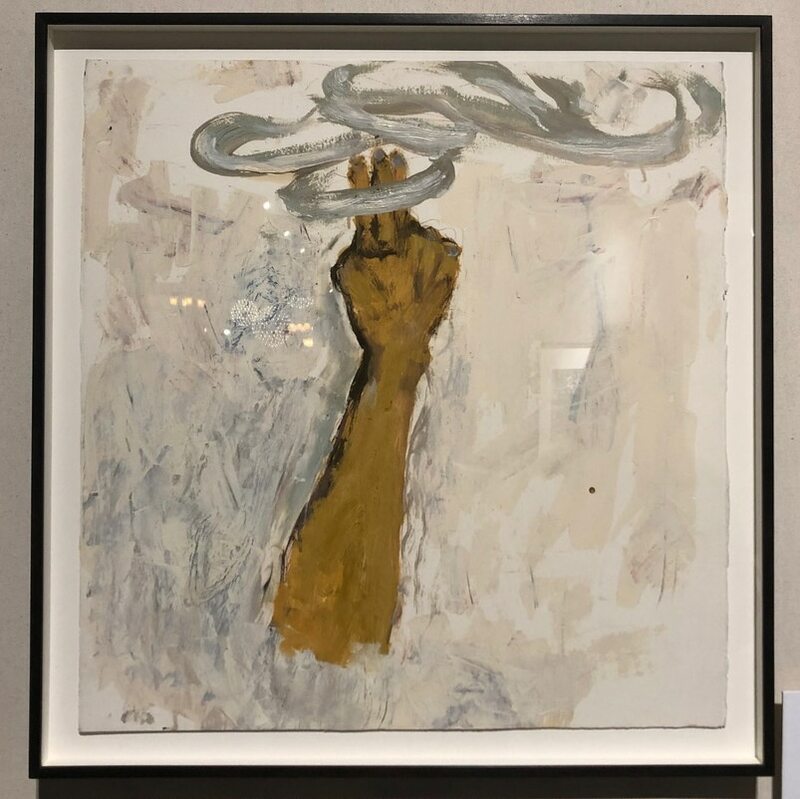 Working in a variety of mediums including drawing, installation, and video, LA based artist, Andrea Bowers centers her work on the convergence of art and activism. These marker on found cardboard drawings represent images of powerful women and are, what Bowers calls, DIY political posters. 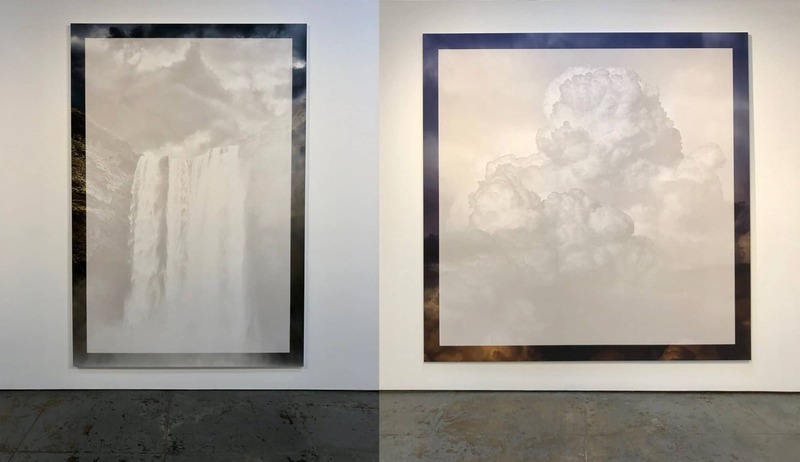 Christian Eckart, “Waterfall” & “Clouds”, 2019 at Wilding Cran Gallery. This exhibition, titled “White Noise” at Wilding Cran Gallery, consists of Christian Eckart’s photographs of climate change. Eckart has digitally voided, with semi-transparent white, much of the beauty found in these type of found on the internet. Eckart is re-presenting romantic sublime imagery for the purpose of reconsidering its primal power specifically in the context of the potential extinction of the human species as a result of climate change. 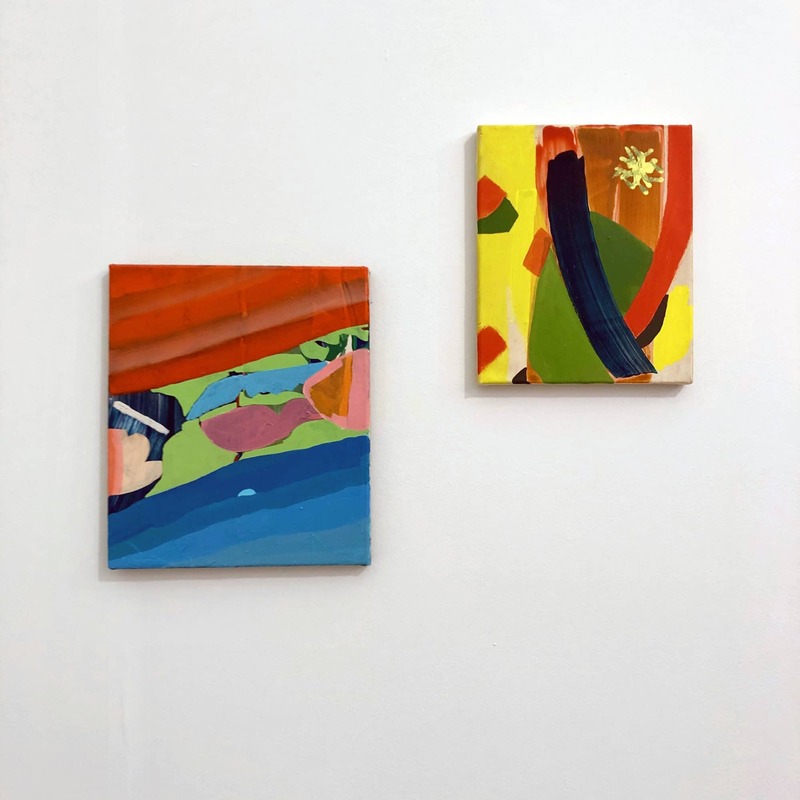 Derek Fordjour, “Signing Day” & “Three Bend Deep”, 2019 at Night Gallery. 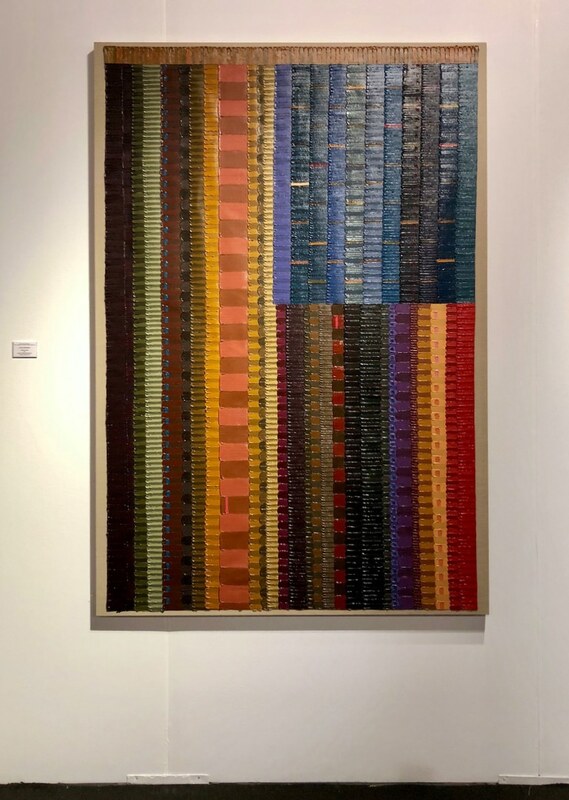 Night Gallery’s exhibition of Derek Fordjour’s painting and sculptures, titled “JRRNNYS”, speaks to various crowds and athletic competitions to illustrate the entrenchment of power relations, capital flows, and racial inequality within the economic and social systems of the United States. Fordjour’s lush and textured paintings amount to a comprehensive worldview, shifting scales from the communal to the individual to the pastoral. Yukie Ishikawa, “Safe and Clean Site”, 1992 & “Sisters”, 1995 at Blum & Poe. (left) Yukinori Yanagi, “Ground Transposition”, 1987/2019 & Shinro Ohtake, “Retina (DNA Shadow III)”, 1990. (right) Yukinori Yanagi, “MORO”, 1998 at Blum & Poe. Blum & Poe exhibition, “Parergon”, is a selected survey exhibition of Japanese art of the 1980s and ‘90s. The exhibition focus’ on the themes of abject politics, transcending media, performativity, and satire and simulation. “Parergon” brings together some of the most enigmatic works that were first generated during a rich two-decade period that are pivotal to the way we perceive and understand contemporary Japanese art today. Keltie Ferris, “KEB + FZF”, 2019 at Morán Morán. Morán Morán’s exhibition of Keltie Ferris: “RELIEF” series paintings are made using acrylic and oil, spray gun and brushes, as well as ensure and impasto. With a variety of scales, these energetic abstractions feel spontaneous and quick, suggestive of water or sound waves. As a result, notions of movement, speed, and technology come to mind when viewing the work. We treasured our visit with Liza Lou in her beautiful studio in Topanga Canyon. Lou has worked in partnership with women beaders in South Africa in the production of her work. While the work is her own, each beader leaves their ‘signature’ evidenced by their unique labor and hand. Lou is a thoughtful and adventurous artist who never stops learning. She continues to push both her artistic practice as well as exploring new ways to improve the lives of women throughout the process of making her work. 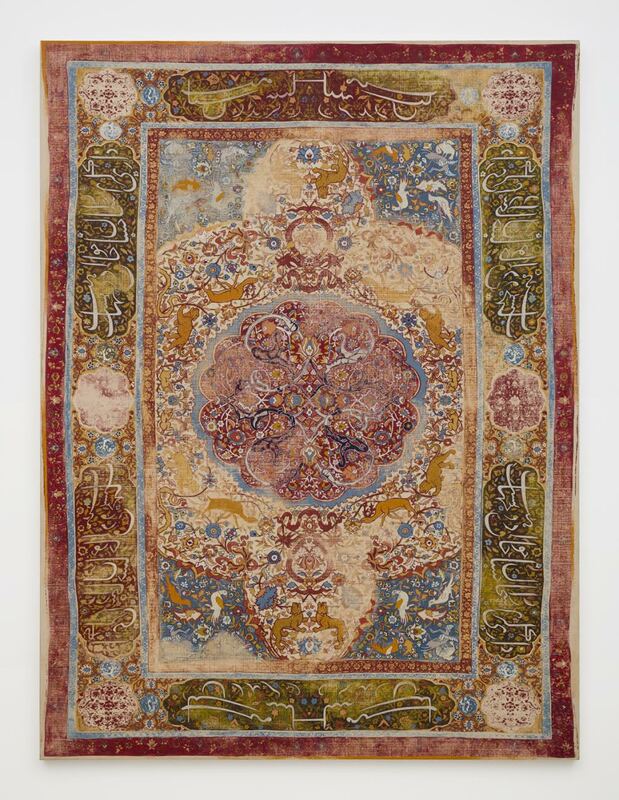 Kour Pour, “North Indian Carpet”, 2016-17. Image courtesy of Ever Gold [Projects]. March 2 to May 4– Kour Pour: Manzareh/ Keshiki/ Landscape at Ever Gold [Projects]: Primarily working with painting and printmaking, Kour Pour’s works encompass diverse subject matter and culturally specific references, ranging from Persian carpets to Japanese prints, and Western Abstraction to Eastern landscape painting. These references are used as starting points for his paintings, in which a source image is often cropped, abstracted, or otherwise modified in palette to create vivid, intricate and layered painted surfaces. Kour’s synthesis of image and process often connects different art histories in an attempt to highlight the cultural exchanges that lead to artistic innovation and disrupt the notion of singular originality. Ever Gold [Projects] is located at 1275 Minnesota Street. Installation view from left to right: Shara Mays, “Bitter Curtsy (Everybody Sing! )”, 2018. Heesoo Kwon, “BoeBoe Altar”, 2018. 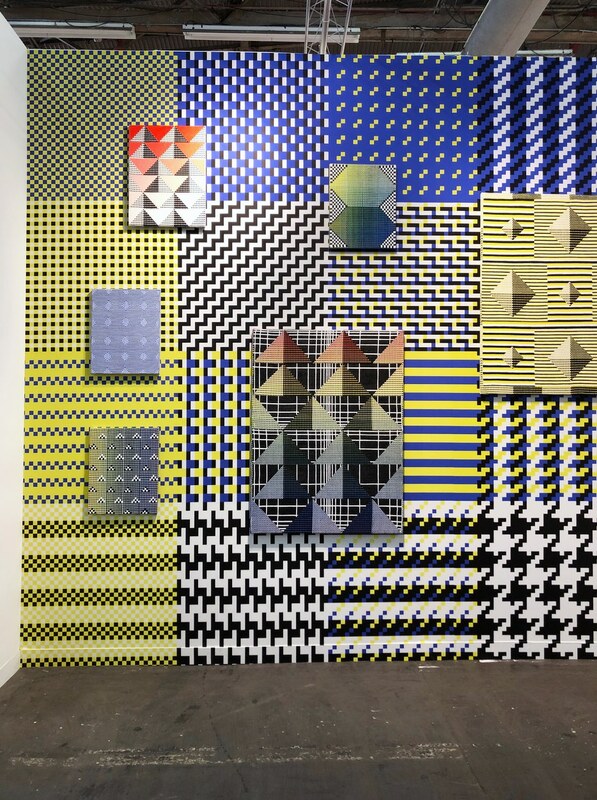 Keisha Mrotek, “It’s a low probability event, however…”, 2018. Image courtesy of Root Division. Ongoing to March 23– MFA Now 2019 at Root Division: The exhibition showcases artists in their MFA programs from nine of the top Bay Area institutions: California College of the Arts, Mills College, San Francisco Art Institute, San Francisco State University, San Jose State University, Stanford University, and University of California, Berkeley, University of California, Davis, and University of California, Santa Cruz. MFA Now provides a platform for looking at Bay Area artists and institutions in order to promote dialogue between programs and to archive current art-making practices and models. The exhibition will include the work of 25 artists that were selected based on a single image and artist statement. The works included in this exhibition display a quality of content and execution that is indicative of the rigor of advanced art degree programs. Works range in media from large scale installation, to video, sculpture, photography and painting. Root Division is located at 1131 Mission Street. 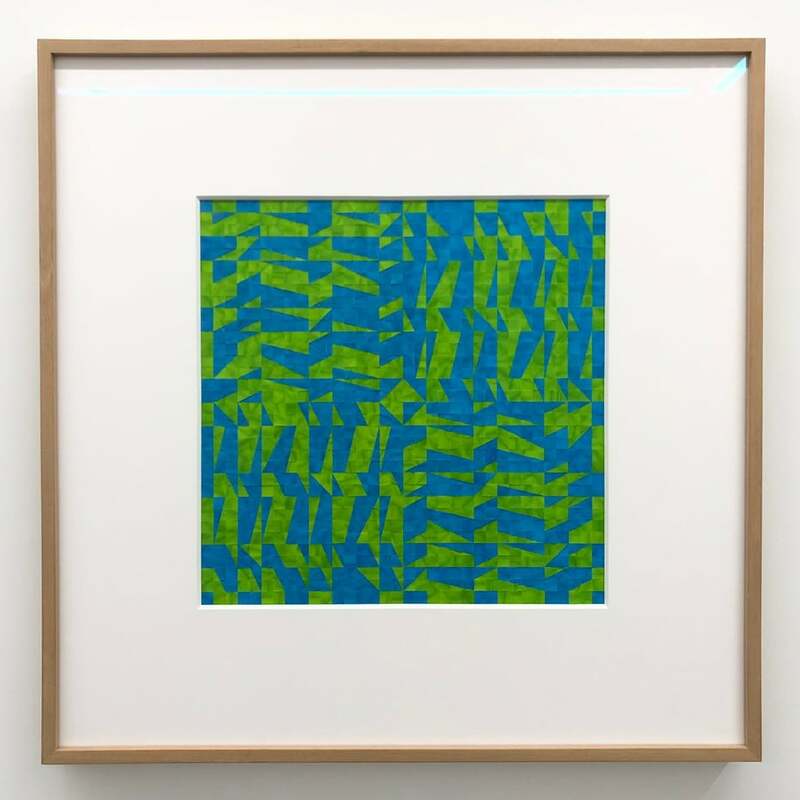 Mark McCloud, “Blue Jungle, Green Jungle”, 1985. Image courtesy of 500 Capp Street Foundation. 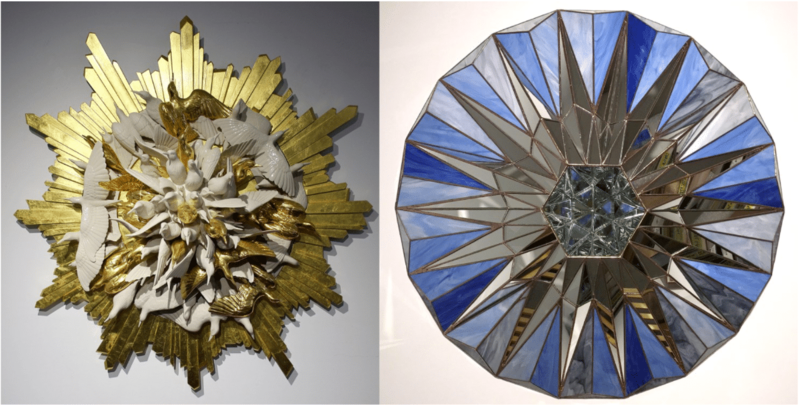 March 9 to June 1– Amulet or He calls it chaos at 500 Capp Street Foundation: This exhibition provides a story about transformations taking place inside “the institution”. David Ireland calls it chaos, as the exhibition unfolds an abstract narrative, shifting viewers’ expectations whenever possible. The works are installed side by side or overlapping and each work is pulled from a distinct narrative thread. Abstract as this may seem, exhibitions allow viewers the opportunity to restructure a narrative, to slow down time. Building moments that represent meaning is a way to tell a story– this exhibition reflects courage and mirrors, desire and pleasure, and it will sustain and survive, even as destruction or construction continues constantly. The works in the exhibition address the power and sensitivity of architecture, gender, politics, and mortality through sculpture, video and painting. Artists included are: Mathis Altmann, Tony Cokes, Moyra Davey, Michel Houellebecq, Hans Haacke, Katharina Grosse, Rashid Johnson, Sherrie Levine, Mark McCloud, Cady Noland, Will Rogan, Jorge Satorre, Cindy Sherman, Gabriel Sierra, Oscar Tuazon, and Andra Ursuţa. 500 Capp Street Foundation is located at at David Ireland House, 500 Capp Street. JR, “Chronicles of San Francisco”, 2018. Image courtesy of Pace Gallery. 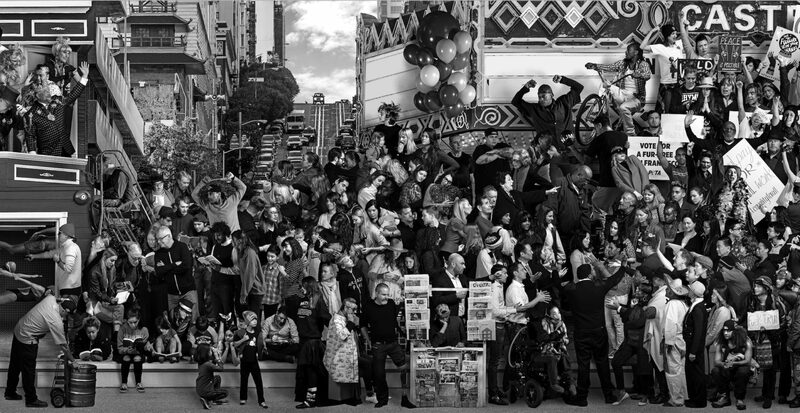 Ongoing to March 24– JR: The Chronicles of San Francisco at Pace Gallery: JR is a French artist and photographer known for his large-scale urban murals that address socio-economic and political issues. This new series of works, dedicated to the city and people of San Francisco, includes portraits, works on paper, video installations, lightboxes, and etched glass works. JR imagines how a whole city and its diversity of residents can be represented through art. San Francisco’s long muralist tradition and its stark contrasts—featuring both immense innovation and wealth as well as one of the country’s highest rates of child homelessness—has made it a vibrant and complex site for the artist to explore and capture. Pace Gallery is located at 229 Hamilton Avenue in Palo Alto. 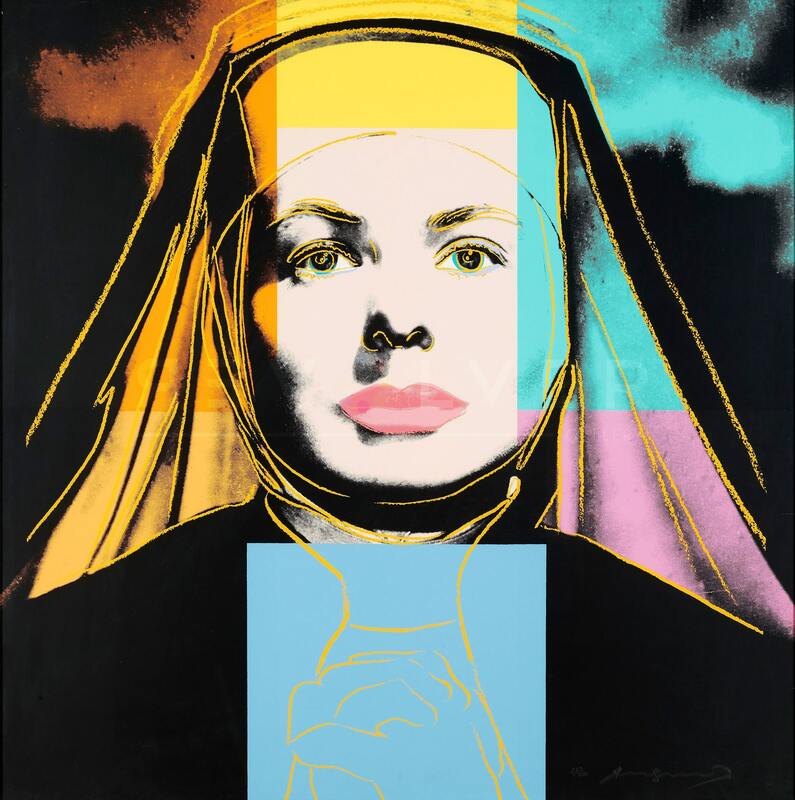 Andy Warhol, “The Nun, Ingrid Bergman”, 1983. Image courtesy of SFAI. Ongoing to March 24– From the Tower: Andy Warhol at SFAI’s Main Gallery at Fort Mason: In anticipation for the Warhol exhibition opening at SFMOMA in May, the exhibition at SFAI explores artworks, images, objects, and stories living within SFAI’s Andy Warhol archives. A series of polaroids, black and white photographs, and screenprints will be exhibited. This exhibition will showcase a range of work from different series, exploring well known themes such as Americana and celebrity to intimate and more personal moments with friends and lovers. SFAI’s Main Gallery is located at 2 Marina Blvd at Fort Mason. (left) Laurel Roth Hope, “Manifest Destiny #2”, 2017. (right) Andy Diaz Hope, “Beautiful Void: Sky”, 2017. Images courtesy of Catherine Clark Gallery. Ongoing to March 30– Andy Diaz Hope and Laurel Roth Hope: An Inexhaustive Study of Power at Catherine Clark Gallery: Throughout their respective careers, Diaz Hope and Roth Hope have created work that responds to the environment and conservation, the dissemination of information through mass media, and the relationship between narrative and spirituality. The exhibition imagines an immersive space that employs “the aesthetics of a richly appointed apartment overlooking a world on the brink of societal collapse.” Diaz Hope and Roth Hope reference design elements found in sources such as presidential portraits and religious art, raising questions about how power is evoked and reflected through visual forms. The artists transform the gallery into a suite of decorated and furnished rooms, with overt nods to the “selfie” culture. While seamlessly blending in with their surroundings, their artworks invite deeper reflection, on the political, psycho-social, and environmental costs of material adornment. Catherine Clark Gallery is located at 248 Utah Street. 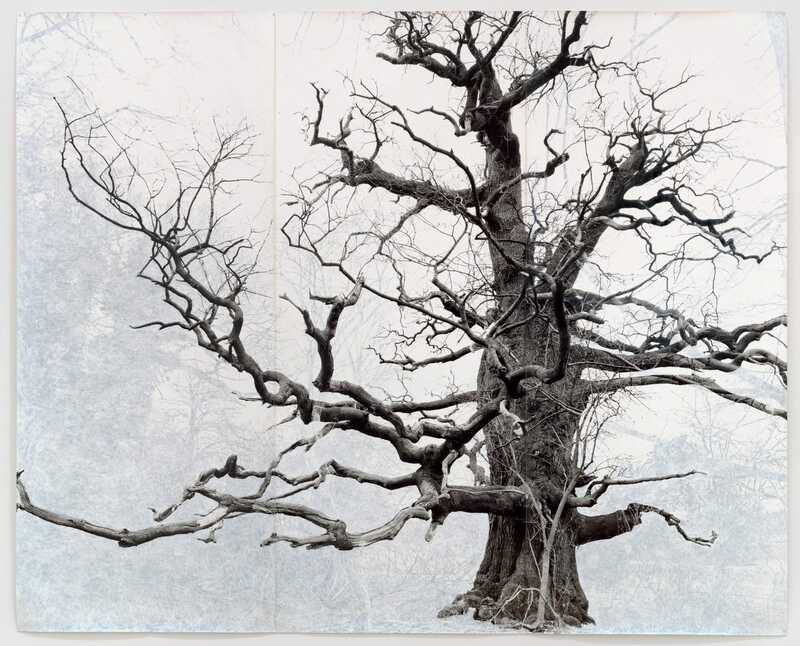 Tacita Dean, “Beauty”, 2006. Image courtesy of the artist and SFMOMA. Thursday, March 21, 7pm– Tacita Dean Artist Talk at SFMOMA’s Phyllis Wattis Theater: British artist and filmmaker Tacita Dean will discuss and present a slideshow of her projects. 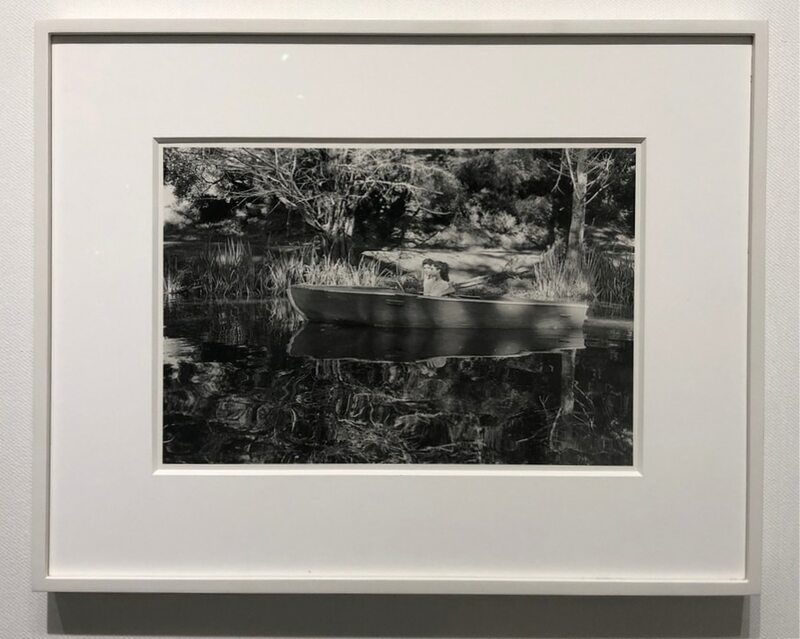 Working primarily in film, Dean’s use of photography seems an act of mourning for the analog world of documents and photographs as it passes into the realm of a massive digital archive. Her recent film portraits express something that neither painting nor photography can capture– they are purely film. Dean‘s work is carried by a sense of history, time and place, light quality and the essence of the film itself. The focus of her subtle but ambitious work is the truth of the moment, the film as a medium and the sensibilities of the individual. She is one of the Young British Artists, was a nominee for the Turner Prize in 1998 and was elected to the Royal Academy of Arts in 2008. This talk is part of the Larry Sultan Visiting Artist Program, co-presented by California College of the Arts, Pier 24 Photography, and SFMOMA. The Phyllis Wattis Theater at SFMOMA is located at 151 Third St.
View from last years event. Image courtesy of Southern Exposure. Saturday, March 23, 6pm– 45 RPM, 45 Years of Southern Exposure Annual Benefit Art Auction at Minnesota Street Project: The annual auction is a celebration of Southern Exposure’s support for the Bay Area’s diverse art ecosystems through the decades. The grand atrium of Minnesota Street Project will be the stage for highlighting some of the greatest hits from Southern Exposure’s history of presenting cutting edge artworks. The event will also have vintage vinyl spinning by DJ Hot Fruit, pop-up performances, and the chance to bid on more than 100 works of contemporary art from emerging and internationally recognized artists through live and silent auctions. Minnesota Street Project is located at 1275 Minnesota Street. 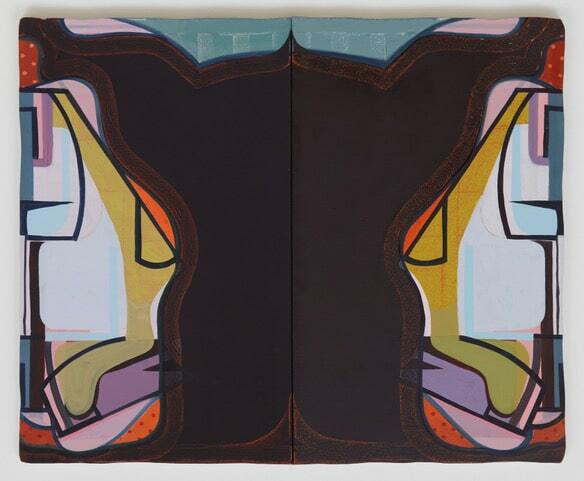 (left to right) Stephanie Metz, “Flesh and Bone Study #3 (Sacrum Vessel)”, 2013. Alan Rath, “Wave”, 1989. Sofie Ramos, installation view of “Space to Breathe”, 2018. Images courtesy of the San Jose ICA. 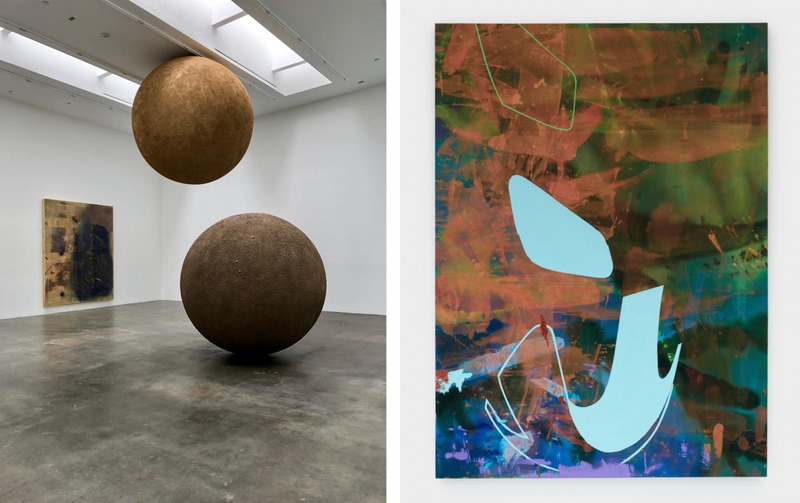 Ongoing to June 9– Stephanie Metz: Figurative Fiber, Alan Rath: Virtual Unreality, Sofie Ramos: Stuff(ed) at the San Jose Institute of Contemporary Art (ICA): Three exciting exhibitions open at the San Jose ICA this month. Stephanie Metz: Figurative Fiber exhibits Metz’s biomorphic abstract sculptures made out of wool and felt. She works primarily in wool and industrial felt to create detailed, complex, and mysterious forms that defy their origins. These sculptures explore the tension created when opposing qualities coexist. Alan Rath: Virtual Unreality marks the first large-scale retrospective survey of work by Bay Area-based artist Alan Rath. All of his sculptures utilize custom electronics designed and fabricated by the artist. Many of his works modify their behavior in unexpected ways over long spans of time, some taking years or even decades to display surprising new imagery. Sofie Ramos: Stuff(ed) consists of immersive, colorful installations that allow the viewer to physically walk into a painting. Shapes, surfaces and objects respond and adapt to, fuse with, and adulterate their surroundings. There are no boundaries or edges; the paint moves from the wall to the floor to objects. San Jose ICA is located at 560 South First Street in San Jose.